Specific dates are generally the date of the Argus carrying the article. Trancriptions are by Luella Hinrichsen unless otherwise noted. Who were George & John Albert? From their dates of birth, they would be supposed to be brothers. An Ancestry search uncovered only one Albert family and that one was in Pawnee City in the 1910 federal census - Strunk & Catherine Albert and their 29-year-old daughter Margaret. Strunk & Catherine were 67 and 56 years old respectively, and had been married 37 years, i.e., since about 1873. At the time that John Albert was born in 1867, Strunk would have been 23 years old. Thus John and George were not Catherine's and may have been from a prior marriage of Strunk Albert. Margaret would have been born about 1881. As of November 2017, any obituary for John Albert has not yet been found. Table Rock Argus, March 16, 1939. William Fremont Albin, who lived at Lincoln, Nebraska was born in Bureau County, Illinois on the 21st day of December 1858, and passed away at the St. Elizabeth Hospital, Tuesday, March 7, 1939 aged 80 years, 2 months and 14 days. At the age of nine years, he moved to Indiana with his parents where he lived for the next eleven years. In 1879 he came to Beloit, Kansas with his two younger brothers in a covered wagon where he lived for four years. On October 25, 1885, he was united in marriage with Mary Elizabeth Jones at Falls City, Nebraska. To this union were born five children: Dollie, who passed away in infancy; Mrs. Minnie Lucky of Lincoln, Nebraska; John who died at the age of thirteen; Mrs. Grace Clark of Lincoln; and Mrs. Nan Robertson who died in young womanhood. In February, 1888, he united with the Christian Church of Humboldt. In 1908 he placed his membership in the Christian Church in Table Rock where he served as Sunday School Superintendent for a number of years. In the fall of 1935 after his wife's death he moved to Lincoln making his home with his daughter, Grace Clark until the time of his death. He was a very affectionate father and lived a faithful Christian life, reading and studying his Bible every day until the time of his death. He leaves to mourn his last two daughters, ten grandchildren and four great- grandchildren; also a sister, Mrs. Sarah Jones of Dawson and many, many friends. ​Table Rock Argus, Jun. 17, 1921. Nan Albin, daughter of Mr. and Mrs. W. F. Albin, who live two and one half miles southwest of Table Rock was born in the vicinity of Table Rock, Nebraska March 5, 1901 and died in Table Rock, Nebraska, June 10, 1921 at the age of 20 years, 3 months and 5 days. Death came as the result of an illness of only a few days. Her sudden death was a great surprise to all. She obeyed the gospel and became a member of the Church of Christ of Table Rock, January 21, 1911, at the early age of ten years and has lived an earnest Christian life from that time until her death. A few evenings before her last sickness, she and her nephew spent the evening singing those old sacred songs, which are so dear to every Christian heart. On October 9, 1918 she was united in marriage to I. E. Robertson. To this union was born one son who died at birth. 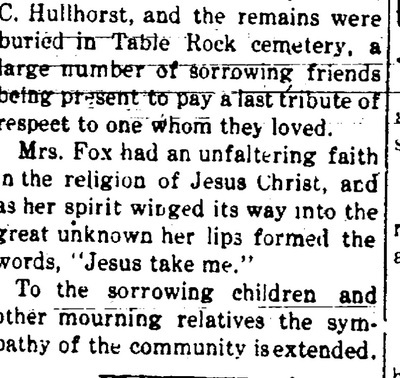 She leaves to mourn their loss, a father and mother, Mr. and Mrs. W. F. Albin, two sisters and their families, Mrs. Minnie Lucky and Mrs. Grace Clark, all of Table Rock and a host of friends, who join their tears and sympathy with the bereaved relatives. Nan was of a sunny disposition having a kind word and pleasant smile for everyone. Truly it may be said of her "Our loss is her eternal gain." Funeral services were held in the Christian church on Sunday afternoon conducted by Rev. a. L. Ogden and the remains were buried in Table Rock cemetery. The services were attended by a large number of friends of the deceased who sorrow with the afflicted relatives over the death of one just at the time when life holds out its sweetest promise. We shall meet to part...no more.. When the blessed Lord doth come. Grace is also buried in Table Rock. An obituary has not yet been located and transcribed. ​Table Rock Argus, July 18, 1935. Mary Elizabeth Jones was born in Licken County, Ohio, May 9, 1867. At the age of eleven years she came with her parents to Brown County, Kansas, in 1878, where the family lived for seven years. 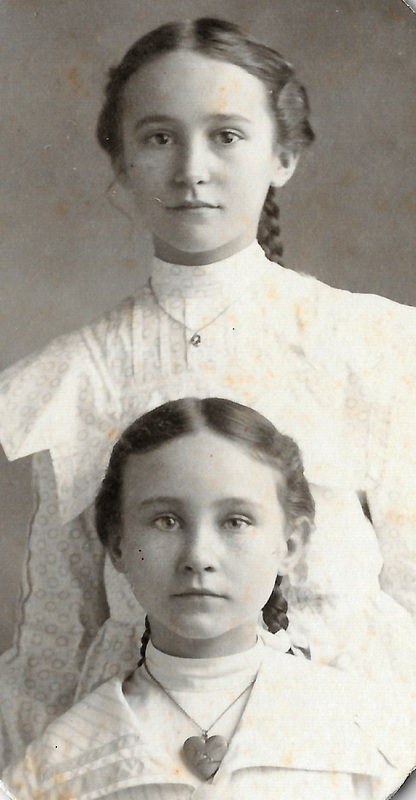 At the age of eighteen years she came to Nebraska with her parents, in 1886. In February 1888, when twenty two years of age, she united with the Christian church of Humboldt, and in 1908 she transferred her membership to the Christian Church of Table Rock. On October 25th, 1885, she was united in marriage to William Fremont Albin, at Falls City, Nebraska. To this union were born five children, Dolly who passed away in infancy; Mrs. Minnie Lucky of Lincoln, Nebr; John who passed away at the age of thirteen; Mrs. Grace Clark of Lincoln, Nebraska; and Mrs. Nan Robertson, who passed away in young womanhood. In 1886, she and her husband moved to Kansas where they remained for two years and then returned to Nebraska in 1888. On March 1st, 1910, they moved to their home southwest of Table Rock where they lived for the past twenty six years. In the spring of 1935 they moved to a farm ten miles west of Pawnee City where she lived until her death which occurred at the hospital in Pawnee City on Saturday, July 13th, 1935, at the age of 68 years, 2 months and 4 days. 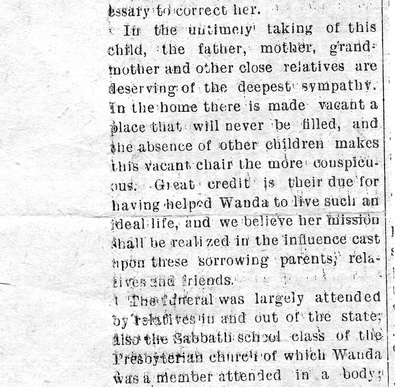 She leaves to mourn their loss, her husband and two daughters, Mrs. Minnie Lucky and Grace Clark both of Lincoln, Nebraska, ten grandchildren, and three great-grandchildren; also by two sister, Mrs. Storant of DuBois and Mrs. Kunhart of Humboldt; five brothers, Will Jones of Boise, Idaho, Evon Hones of Dawson, tom Jones of Humboldt, Ed Jones and Charles Jones of DuBois, Nebr. Funeral services were held at the Christian church on Monday afternoon, July 15, conducted by Rev. F. Grant Hamm, pastor, and the interment was on the family lot in the Table Rock cemetery. John Albin, the only son of Mr. and Mrs. William Albin who live about four miles southeast of Table Rock, was born in the vicinity of DuBois, Pawnee county, Nebraska, January 1, 1890, and died Sunday evening, January 31, 1909. Age 13 years and 30 days. The funeral was conducted at the Christian church, 11 a.m. Tuesday, by the pastor. Many beautiful flowers, tokens of sympathy of loving friends, gave a sweet aroma to the air of the entire room. The capacity of the church was entirely inadequate to accommodate the host of friends who were present to pay their respects to the memory of this noble young man and to show their sympathy to the sorrowing parents and sisters. 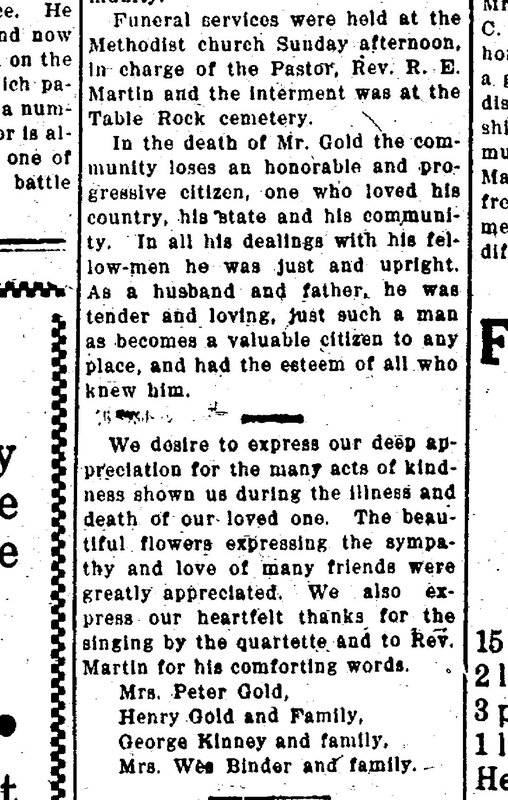 John leaves a father and mother a married sister, Mrs. Minnie Lucky of Table Rock, two little sisters, Grace and Anna, many relatives, and a host of friends to mourn his loss. His sudden death was a great surprise to all. But the day before, save for a cold, he seemed to be in rugged health and strength. Saturday afternoon the deadly pneumonia with congestion of the lungs seized him and before 9 o'clock Sunday evening he was summoned Home. The music rendered at the funeral at both the church and cemetery was very appropriate and tenderly rendered. The song, "Jesus is Calling" was announced as the special favorite of the deceased and sung so beautifully that it brought tears to the eyes. The minister spoke from the words of the Preacher, Eccl. 12:13 "Let us hear the conclusion of the whole matter: Fear God and keep His commandments; for this is the whole duty of man," contending that this young man had done his whole duty in a much greater sense than many a man who has lived his allotted time of three score years and ten or more and has amassed millions of wealth or has acquired fame or honor or power or distinction among his fellows, for he did "fear God and keep his commandments," and thus do his "whole duty." He came into the church early in November last, and lived a faithful, consistent Christian life until its close. As a boy, he was ever loving, obedient and courteous to his parents, kind and affectionate to his sisters, and a general favorite among all his associates. As a Christian he was loyal to Christ's church, regular in his attendance at the church services, Bible school, the Christian Endeavor, the prayer meeting and all the social functions of the church. He, together with his boon companion, Mertie McNulty, was elected usher and was serving in that capacity at the time of his death. Rarely do we find a young man of such spotless character, such sterling worth, and such nobility of soul as John Albin, and may we while sympathizing with parents and sisters for their loss, rejoice with him because thus early he was called to his reward. His remains were laid to rest in a steel vault in a beautiful cemetery at Table Rock. The pallbearers were his friends and companions, Merle McNulty, Alfred Fielder, Clarence Fielder, Glenn Cook, Myron Glenn and Ernest Wilcox. 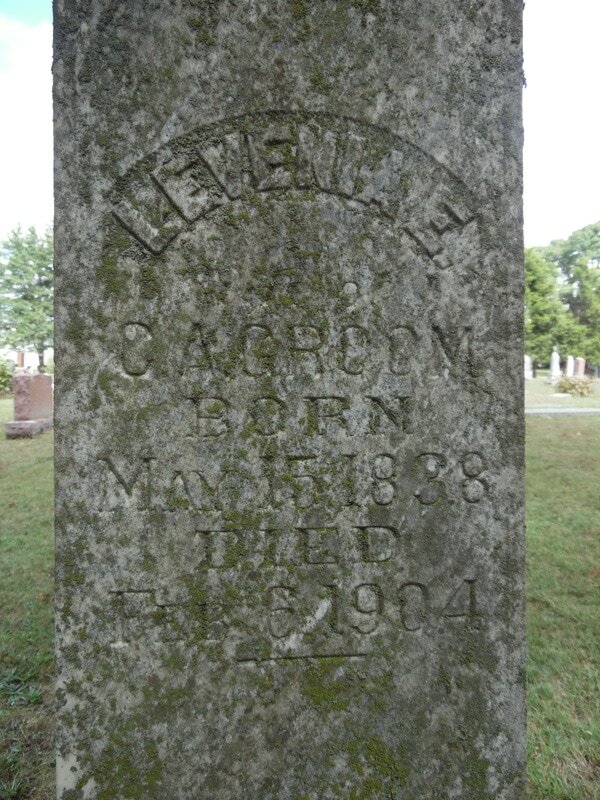 Background: According to information on FindaGrave, Theodore & Sarah were married in Allendale, Missouri, on October 3, 1880. They had at least eight children and all seven if the eight known are buried at the Table Rock Cemetery: Cora Alderman Epley (1882-1946), William (Will) Alderman (1884-1969), Nancy Alderman Hays (1886-1966), Maud Alderman Morton (1888-1982), Grace Alderman Boltjes, (1892-1956), Ralph Alderman (1894-1964), Orville Alderman (1896-1970), and George Alderman (1898-1965). Any obituary for Theodore or Sarah Mosbarger Alderman has not yet been found, as of November 1917. Cora is buried at Grandview Cemetery in Elk Creek, Nebraska. She married Harvey David Epley in 1898, and they had eighteen (yes, eighteen ) children, with no twins, born 1899-1928. They had no children, but those who knew them say that they loved children. Will was janitor at the school for over 20 years and was said to have been beloved by the children there. William was the 2nd of the 9 children of Theodore & Eliza Alderman of Elk Creek. TABLE ROCK ARGUS, May 1, 1969. Funeral services were held Saturday afternoon in the United Methodist Church in Table Rock for William A. Alderman, 84, who passed away suddenly at the Kline Home in Pawnee City on Thursday. Final rites were conducted by the Rev. Floyd Green. Interment was in the Table Rock cemetery. Mr. Alderman was born at Elk Creek and has lived in the Table Rock community nearly all his life, having farmed near here before moving into town. He became school custodian in 1935 and continued this profession for 22 years, retiring in 1957. Pallbearers were Howard Herrick, Lloyd Vrtiska, Lewis Day, L. J. Wenzbauer, Rudy Zelenka, and Willard Binder. Mrs. Robert Freeman was soloist and Mrs. George Tomek the accompanist. William Arthur Alderman was born to Theodore and Eliza Alderman at Elk Creek, Nebr. on July 23, 1884. He was the second child of nine children- five boys and four girls. He passed away on April 24, 1969 at Pawnee City, Nebr. On February 14, 1906 he was married to Nellie Myrtle Horton, Table Rock. In 1907, Clarence Ross came to make his home with Will and Myrtle, staying five years with them before going back to his home in Iowa. Will has made his home in and around Table Rock engaged in farming, and later moving into Table Rock, where he has made his home until his death. He was a member of the Methodist Church here for many years. He was a faithful member. His father and mother, wife Myrtle, three sisters and two brothers preceded him in death. Will was a kind and good husband, neighbor and brother. always ready to lean a hand in time of need. Myrtle & Will Alderman, Photo 3607, shared by their niece Glenda Alderman Blecha. 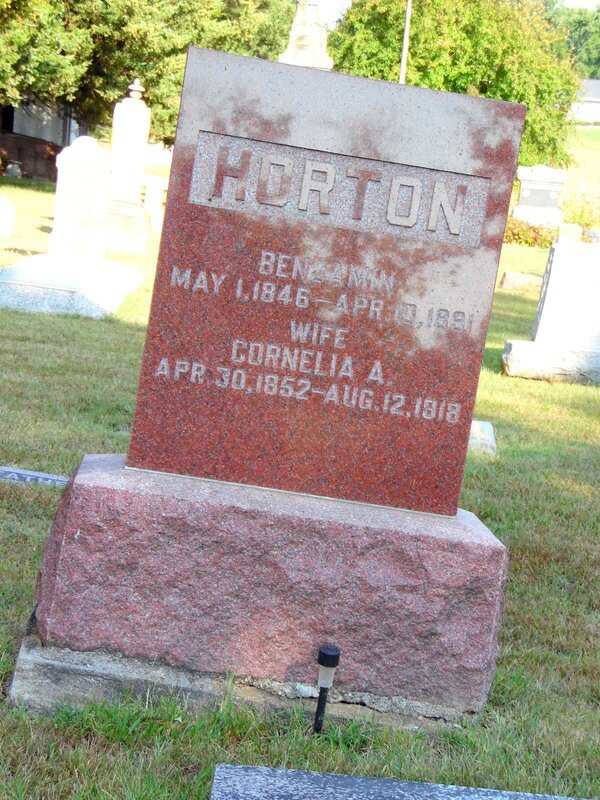 Nellie was one of the 11 children of Benjamin & Cornelia Horton. Benjamin was a Civil War veteran. Present Alderman family members like Art Alderman and his daughter Glenda Blecha say that Nellie went by her middle name of Myrl. ​Table Rock Argus, Oct. 19, 1961. Mrs. Will Alderman passed away early Friday morning at her home in Table Rock at the age of 77. Funeral services were held on Sunday afternoon from the Methodist Church with the Rev. LeRoy Leland officiating, and interment was made in the Table Rock cemetery. Pallbearers included Jay Barnard of Pawnee City, Rudy Zelenka, Arnold Petrasek, Gordon Bethel, Lawrence Wenzbauer, and Charles Binder of Table Rock. Mr. and Mrs. George Tomek provided the vocal numbers, accompanied on the piano by Miss Cynthia Meier. Mrs.Alderman is survived by her husband, William; a sister, Mrs. Grace Doyle, Lincoln; a brother, Art Horton, Table Rock; and sisters-in-law, Mrs. Ida Horton and Mrs. Lydia Horton, both of Roswell, New Mexico. Nellie Myrtle Horton was born May 1, 1884 to Benjamin and Augusta Horton. She was one of eleven children, seven boys and four girls. She lived all of her life, with the exception of about five years, in Pawnee county. In 1907 Clarence Ross came to make his home with Will and Myrtle and remained for five years. Clarence now resides in Sioux City, Iowa. Myrtle was loved by all who knew her, and she was always willing to be of help to anyone who needed her. She has been a member of the Methodist Church for many years and was a faithful member and devoted Christian. She leaves to be saddened by her passing, her devoted husband, Will; a sister, Mrs. Grace Doyle of Lincoln; a brother, Art Horton of Table Rock; two sisters-in-law, Mrs. Ida Horton and Mrs. Lydia Horton, both of Roswell, New Mexico; many nieces and nephews; and a host of friends will miss her kind face and warm personality. She chose the scripture, John 14, and the songs to be sung. She was, we are sure, in tune with her Maker for she left as she so desired- quietly. That I might live like Thee." TABLE ROCK ARGUS, Dec. 25, 1952. MRS. SYLVIA ALDERMAN PASSES AWAY SATURDAY AFTER LONG ILLNESS. Final rites will be held Friday afternoon at the Methodist Church in Table Rock for Mrs. Sylvia Alderman of near Pawnee City, who passed away suddenly Saturday morning at her home. She had been in failing health for several years, and became critically ill in September, and after a months stay at the hospital, was brought home. Mr. and Mrs. Alderman, married in 1923, had lived in the Table Rock vicinity prior to moving on a farm south of Pawnee City. They had also lived in Omaha, in Colorado and in Iowa. Surviving the deceased, besides her husband, are seven children: Walter of Ruskin, Neb. ; Arthur and Darreld of Kansas City, Ks. 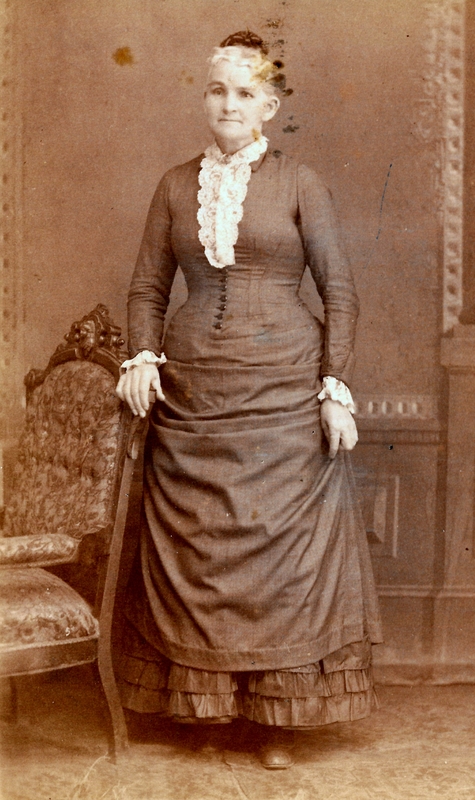 ; Mrs. Lucille Clark of Table Rock; Duaine, in the service on the west coast; and Shrie and Byford, residing at home. Five brothers and sisters surviving include Lula Beebe of Leavenworth, Ks. ; Ruby McAlpine of Beatrice; Marvin Shepherd of Fairmont; Cleo Epley of Sterling; and Roy Shepherd of Ansley. WILLIAM BINDER- A telegram from Mrs. Binder came from Corpus Christi, Texas, early Sunday morning, that her husband, William Binder, died in that city on the morning of the 24th, and that she would arrive here with the body on Tuesday afternoon. For some time he had been in poor health, and a few weeks ago he left for Texas, accompanied by his wife, in the hope that a change of climate would be beneficial to him. The hopes of himself and friends failed of realization, and he became worse and died as above stated. Mr. Binder came to table Rock in 1893, and bought a farm known as the Brigham farm, upon which he lived until he moved to the forty just west of town about two years ago. To the Brigham farm he kept adding adjoining acres until he was one of the largest land owners in this vicinity, he and his sons owning 1,000 acres all connected. To the church and other causes which appealed to him, he always was a liberal giver and he had many qualities which endeared him to those who knew him. The funeral services were held in the M. E. church on Wednesday afternoon at 2:30 o'clock conducted by Rev. S. E. Taft, a large audience being present to pay a tribute of respect to his memory. Interment was int he Table Rock cemetery. William Binder was born in Bodenhein, Germany, April 11, 1853, and died at Corpus Christi, Texas, March 24, 1918, aged 64 years, 11 months and 13 days. He came to America in 1879, and settled in Yellowband, Minn. He was married to Katherine B. Keller on December 31, 1880. He was raised a German Lutheran, but after coming to America he united with the Table Rock M. E. church and has since remained a faithful member. They moved to table Rock in 1893 and have remained here ever since. To this union were born six children, one of which died in infancy. 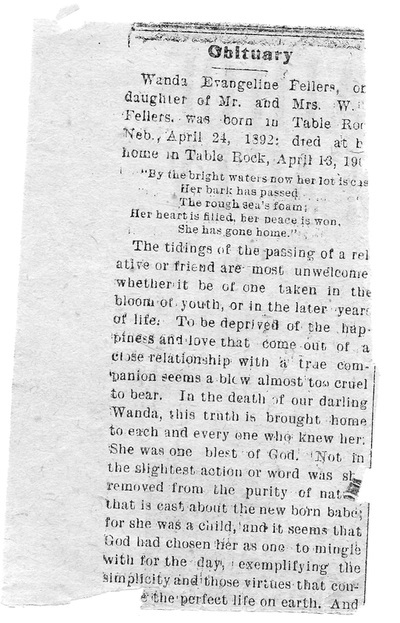 Those who remain to mourn the loss are the widow and the five children- Will, Charles, Anna, Wesley and Hattie, all of whom reside in Table Rock, with the exception of Anna, who lives in Moccasin, Arizona; and four brothers, two in Germany and two in America, together with a host of friends. Table Rock Argus, Feb. 20, 1933. Mrs. Kate Binder, who has been very ill at her temporary home in Lincoln for the past few weeks with heart trouble passed away at an early hour Sunday morning. She was the widow of the late William Binder, who died a number of years ago. The Binder family have been residents of this vicinity for a great many years. She is survived by three sons, W. J., c. J., and W. R., all of Table Rock, and by two daughters, Mrs. Anna Farrow of Cedar City, Utah, and Miss Hattie Binder, journal clerk of the senate. Funeral services will be held at the Methodist church Tuesday afternoon at 2:30 and the interment will be in the Table Rock cemetery. Mrs. Binder was 74 years of age. Katherine Barbara Keller was born in Wertemburg, Germany, June 20, 1858, and passed away at Lincoln, Nebraska, February 5, 1933, at the age of 74 years, 7 months and 5 days. At the age of fourteen years she came to this country and made her home in Morristown, Minnesota, until her marriage to William Binder on December 31, 1880, in 1889 they came to Nebraska and located at Schuyler. To this union six children were born: William J., Charles J., Wesley R. and Hattie M. of Table Rock, Anna V. Farrow of Cedar City, Utah; Johana, who passed away in infancy. Besides these she leaves to mourn her death, her brother J. J. Keller of California; eleven grandchildren and a host of friends. Mrs. Binder was a member of the German Lutheran church and later joined the Methodist church of which she was a member until her death. She was always an active and willing member, so ready to do her part in affairs of the community and church even when poor health overtook her we always found her attending and helping in the activities of the church. In her home she was a helpful wife, kind and loving mother. One of her outstanding characteristics was her cheerfulness and bravery in the face of ill health and sorrow. Calmly say "Thy will be done." Evermore "Thy will be done." Funeral services were held in the M. E. church Wednesday afternoon at 2:30, conducted by the pastor, Rev. W. E. Caldwell, who preached an earnest, helpful sermon, appropriate music was furnished by a mixed quartette. Interment was in the Table Rock cemetery. Will's obituary has not yet been found. Table Rock Argus, Mar. 7, 1963. Death claimed the life of Mrs. Nellie Mae Binder, 80, Tuesday morning at the Pawnee County Hospital. Mrs. Binder was a life-long resident of this community and was a graduate of Table Rock high school with the class of 1900. She was the wife of the late W. J. Binder, a prominent farmer of the area. For the past several years, Mrs. Binder had made her home in Table Rock, but for the past few weeks had remained at the home of her son due to failing health. Mrs. Binder was born in Table Rock on October 22, 1882, the fifth child of seven children born to Isam and Katherine Bain. She joined the Methodist Church at an early age. 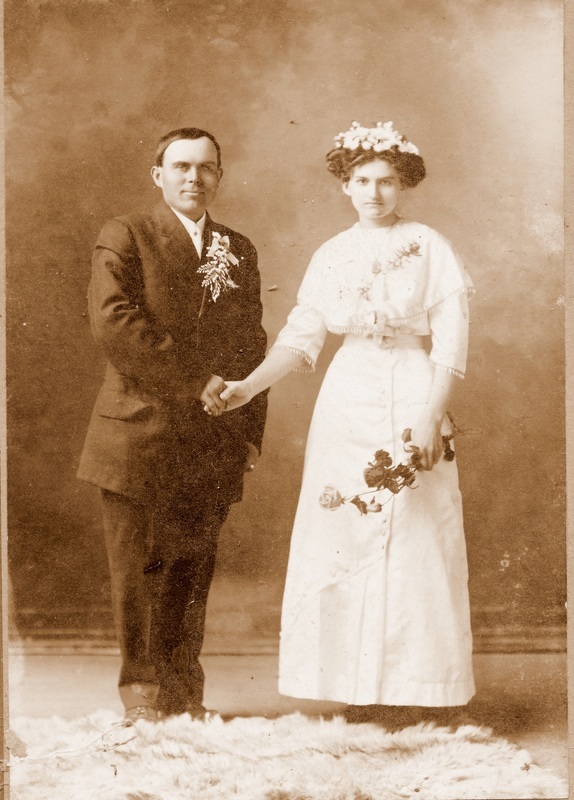 On December 10, 1913 she was united in marriage to William J. Binder at Pawnee City. To this union was born one son, James Binder, and the couple raised Guy C. Binder, a son of William's cousin. She is survived by one brother, Roy Bain of Table Rock, her son, Jim Binder, wife, and grandson, George of Table Rock; and Guy Binder, wife and two sons of Pawnee City. She was always of cheerful disposition and a wonderful mother and grandmother. Funeral services will be held from the Methodist Church in Table Rock, Friday afternoon at 2:00 with the Rev. Dale Coakley officiating. Interment will be in the Table Rock cemetery. Pallbearers will be Lloyd Vrtiska, Floyd Vrtiska, Fred Jelinek, Lorain Bebensee, Albert Miller and Cleo Koeneke. Son of William and Katherine (Keller) Binder. Father of Charles, Glen, Joseph, Leland, Willard, and Ruth. Table Rock Argus, Sept. 20, 1962. Charles J. Binder, son of William and Katherine Keller Binder, was born the second of six children on September 28, 1883, at Yellow Bank, Minnesota. He passed away while at work on September 17, 1962 at the age of 78 years, 11 months and 19 days. His early childhood was spent in Minnesota with his parents, brothers William J. [who passed away in 1954], and Wesley R. of Table Rock; and sisters, Anna Farrow, San Diego, Calif. Hattie Johnson, Portland, Oregon; and Joanna who passed away in infancy. Charles came to Nebraska with his parents in 1888, locating at Richland, later moving to Table Rock in 1893, settling on the homeplace west of town where he spent most of his life farming and feeding livestock, moving to town in 1951 and since has helped in the operation of the lumber yard. He entered the membership pf the Methodist Episcopal Church by confession of faith on April 14, 1908, and has since that time served his Lord faithfully in teaching Sunday School and directing youth work. On June 9, 1916 he was united in Holy Matrimony with Violet Mary Branek. To this union were born six children, a daughter Ruth [who passed away at an early age]; five boys: Charles W. [who passed away this past May 8th]. Glenn W., Joseph R., Leland R. and Willard D.
Charles J. served this community in various capacities: the Church board, Farmers Union board, School board, Cemetery Association board, and the Pawnee County Weed District board. He is survived by his wife, Violet,; four sons, Glenn, Joseph, Leland and Willard; five daughters-in-law; 18 grandchildren; one brother, Wesley R.; two sisters, Anna Farrow and Hattie Johnson; other relatives and a host of friends. Not young, it is true, but well and gay. He never acted small and mean. A prince of a man, that Dad of mine. By scores of friends whose hearts he cheered. Nor stamped his foot upon the floor. Of hearing each one say his say. And let the hotheads rant at will. Had altered his clear view of right. And "love thy neighbor" was his text. In that far land across the sky. Of aught but fineness comforts me. Table Rock Argus, Sept. 16, 1976. Violet Mary Branek was one of twin daughters born to Joseph and Mary Burget Branek on January 30, 890, in a log house on a farm north and west of the Clear Creek School. In January 1901, the family moved to a farm 4 1/2 miles west of Table Rock. The same year in June, her father passed away. In early childhood the family attended the Presbyterian Church in table Rock with Aunt Louisa Davenport until it closed. Later the family attended the Methodist Episcopal Church. On June 9, 1915, Violet was united in marriage to Charles Jacob Binder. They made their home 1 1/2 miles west of Table Rock. To this union were born six children:Ruth Alline, Charles William, Glenn Wallace, Joseph Ralph, Leland Richard and Willard Dale. Violet joined the Methodist Episcopal Church in table Rock where she was faithful in attendance. In 1951 she and her husband moved to town where she resided until the fall of 1975 when she suffered a stroke. Following this she has been in the Humboldt Hospital and Colonial Acres Nursing Home, where she passed away September 6, 1976. Violet was preceded in death by her parents, Joseph and Mary Branek; her daughter Ruth, who died at an early age; her twin sister, Lilly Hunzeker; her step-father, Joseph Morse; her sisters Hilda Steiner, Ida Kent, and Lena Shepherdson; her brother Joseph; her son, Charles W. Binder,; and her husband, Charles J. Binder. She is survived by sisters Martha Rice of Lincoln and Frances Johnson of Table Rock; four sons and their wives, one daughter-in-law, Mrs.Beth Binder; 28 grandchildren, 2 great-grandchildren and many other relatives and friends. 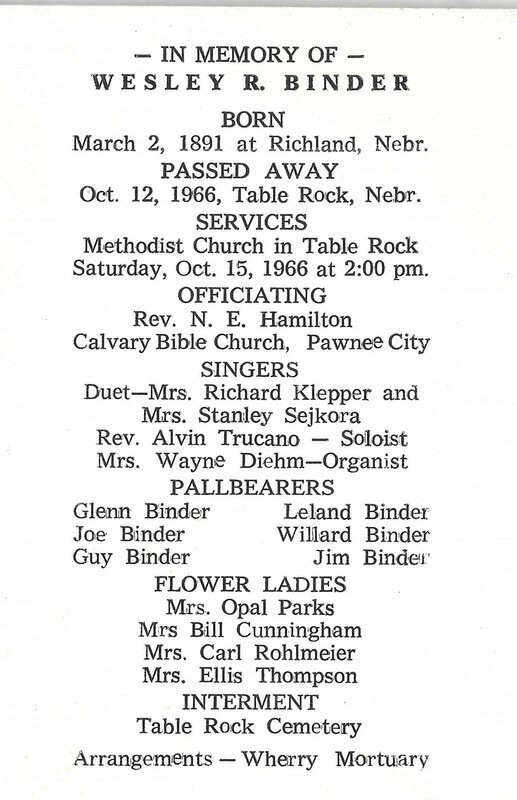 Funeral services were held Thursday, September 9, 1976 at 2 P.M. at the United Methodist Church in Table Rock, Nebr., with Rev. John Hodges and Rev. Mark Boud officiating. Music was "Love Divine", "My Faith Looks Up To Thee", sang by the congregation with Mrs. George Tomek at the organ. Pallbearers were Kevin Binder, Kendall Binder, Philip Binder, Jonathan Binder, Timothy Binder and Peter Binder. 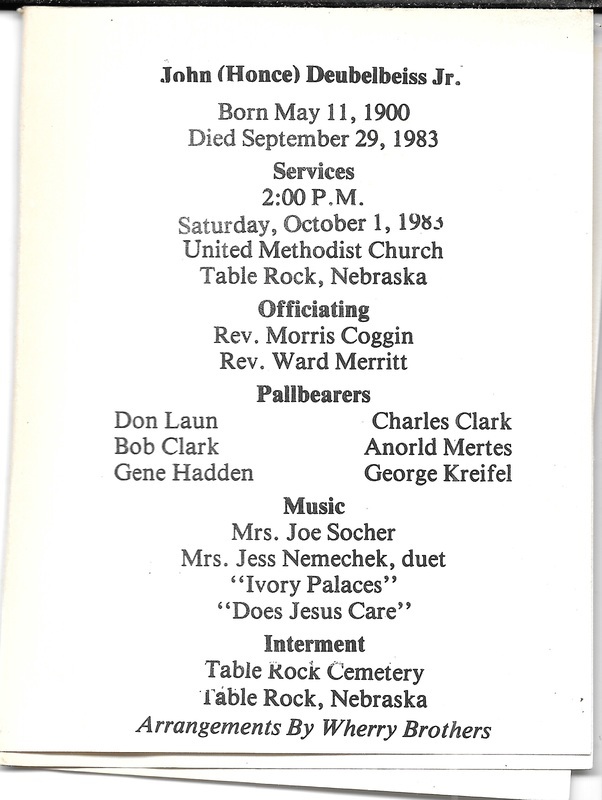 Interment was in the table Rock Cemetery at Table Rock, Nebr. Anna Binder Farrow (1885-1972) is buried at Mount Hope Cemetery in San Diego, as is her husband Edgar (1873-1947). 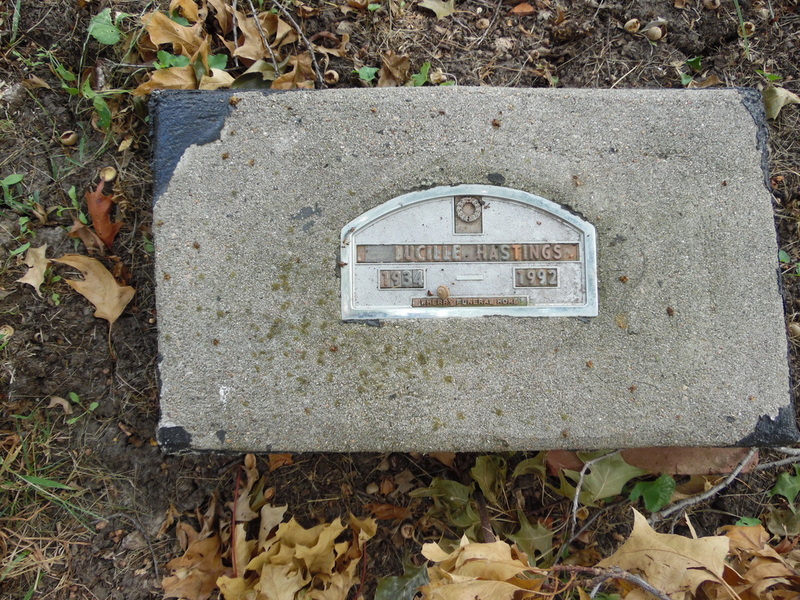 Her son William is buried in Greenwood Memorial Park in San Diego with his wife Wilma. ​TABLE ROCK ARGUS, Oct. 13, 1966. Wesley R. Binder passed away unexpectedly about 11:00 a.m. Wednesday morning following a heart attack at his home west of Table Rock. He had observed his 75th birthday last March. Funeral services have been set for Saturday afternoon at 2:00 o'clock from the Methodist Church in Table Rock with the Rev. N. E. Hamilton, pastor of the Calvary Bible Church in Pawnee City, officiating. Interment will be in the Table Rock cemetery. A memorial fund for Missionary Timothy Pietsch of the Tokyo Bible Center has been established. Mr. Binder has been a prominent farmer of the Table Rock area for many years. He is survived by his wife Goldie; two sons, Howard and Forrest of Table Rock; and a daughter, Mrs. Don (Lois Mae) Lynch of Springfield, Va. Also surviving are two sisters, Mrs. C. C. Johnson of Portland, Oregon and Mrs. Anna Farrow of San Diego, Calif. Two brothers, Charles J. and William J., and a sister, Johanna, preceded him in death. ​An obituary has not yet beenfound. Hattie (1895-1988) is buried in the Willamette National Cemetery in Oregon, with her husband, Clarence Johnson (1899-1964). Julia graduated from Table Rock in 1908. She is buried in the Czech Cemetery east of Table Rock. Mrs. Julia Breuer, about 72, died suddenly of a heart attack at Council Bluffs, Ia., about 5:00 a.m., Sunday morning. She was apparently recovering satisfactorily from injuries sustained in a car accident on July 20th in which John J. Wopata was killed. She had visited in Table Rock the week before, and had planned to return home after another week's stay at the hospital. She had lived here the past two years after returning from California. During her earlier years, she taught school in rural districts in Pawnee county. Funeral services were held from the Wherry Chapel in Table Rock on Tuesday afternoon with the Rev. Ward Merritt officiating. Interment was made in the Bohemian National Cemetery east of Table Rock. Pallbearers included six of her former grade school pupils from the former Pleasant Hill District No. 52. They included Lloyd Ritchie, O. A. Gold, Cecil Sandusky, L. R. Sochor, Frank Sochor and Vernon Sandusky. She was the daughter of Anthony and Mary Strejc, and was preceded in death by her father, her husband, and a son, Stanley. She is survived by her mother, Mrs. Mary Strejc; a sister, Mrs. Rudolph Stanek; and two daughters, Dr. Rosalie Neligh of Council Bluffs, Ia., and Dr. Mildred Dale of Encino, Calif.; and other relatives. NOTE: THE NAME HAS BEEN FOUND AS BRODERS, BROTHERS, & BROEDER. Table Rock Argus, Oct. 3, 1912. Theophil John Brothers son of Fred and Mary Brothers was born March 1, 1891 in Table Rock, Nebraska. Died September 25, 1012. He was married to Miss Rose Parker of Humboldt, Nebraska on January 20, 1911. 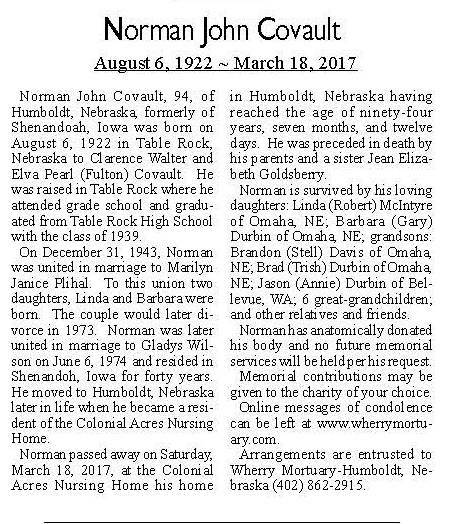 There are left to mourn his untimely departure His Wife, Father, three Brothers and two Sisters, all of Table Rock, except Hermon who lives at Wymore, Nebraska. Funeral services were held at the Christian Church on Friday afternoon September 27, J. E. Wilson, minister officiating. He was laid to rest in the Table Rock cemetery to await the resurrection morning. No obituary has been located. The only edition of of the Argus from 1890 to have survived was in October. It may be that the Pawnee Republican has information. Gottfried was a Civil War veteran. He was a private in Company E of the 13th Kansas infantry. Gary Bucholz related a story to Sharla Cerra as to Gottfried's death, as told to Gary by his grandfather, who was a boy of about 10 at the time. Gary's grandfather was with Gottfried, who was in turn Gary's grandfather's grandfather. They were down at the Table Rock depot with some others, and needed to be on the other side of the tracks. A train was sitting there, and they believed that it was not hooked to an engine. However, as Gottfried was crawling under the train to get across the tracks, the train moved and he was killed. The little boy was terribly traumatized, of course, and remembered the events clearly all his life. GRANDMA BUROW HAS BEEN A RESIDENT OF TABLE ROCK FOR OVER 79 YEARS. Funeral services were held Tuesday afternoon at the Methodist Church in Table Rock for Mrs. Louisa Burow, 88 who passed away peacefully on Saturday noon. She had been a resident of this community for 79 years. Rev.W.H.Merrill was in charge of the services. Burial was made in Table Rock cemetery. Louisa (Frank) Burow, daughter of Gottfried and Wilhelmina Frank, was born in Germany March 20, 1856 and died April 22, 1944 in Table Rock at the age of 88 years, 1 month and 2 days. Louisa came to America with her parents in 1867 and with them settled in Pawnee county a few miles northeast of Table Rock. In 1872 she was married to Gottfried Burow and to this union eight children were born. In 1873, Mrs. Burow was converted in a Camp Meeting and united with the German Methodist Church in Humboldt, Nebraska and remained a member of that church until she moved into Table Rock with her father in 1910 at which time she had her membership transferred to the Methodist Church in Table Rock, where she has been an active member until her death. She became a member of the Rebekah Lodge soon after coming to Table Rock. 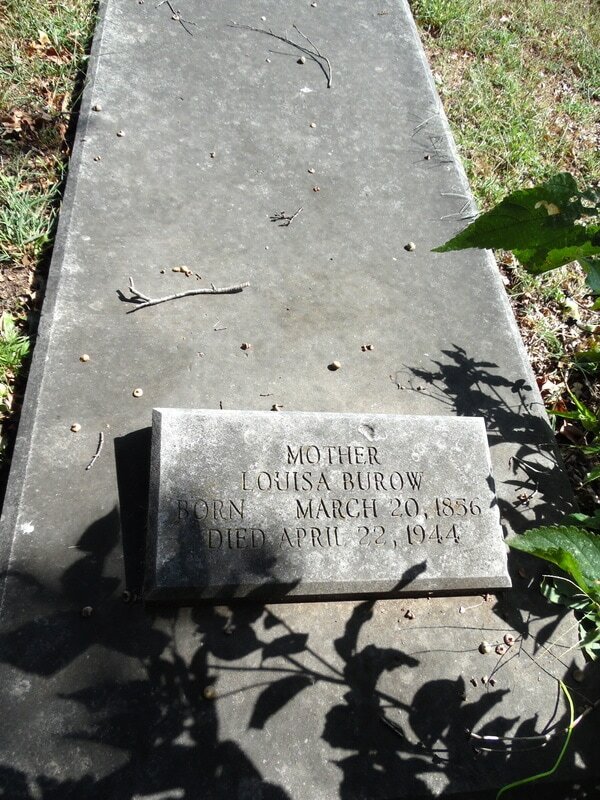 Mr. Burow died in 1890 and her father in 1913. 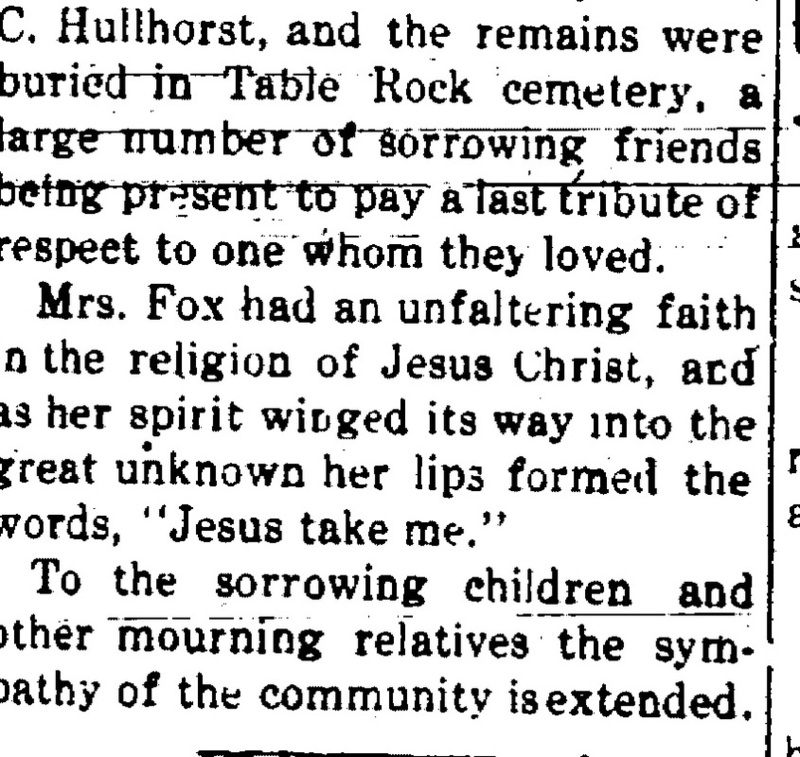 Mrs. Burow leaves to mourn her departure, her eight children, Ernstina Polhman of near Table Rock, William of Table Rock, Charles of Elk Creek, Minnie Gold of Chadron, August of Humboldt, George of near Table Rock, Gottfried of Humboldt, and Luther of Bell, California. Eighteen grandchildren and fourteen great-grandchildren, also (unreadable) other relatives and friends. Miss Valerie Merrill sang a vocal solo "There'll Be No Disappointment in Heaven" and Donna and Dolores Karas rendered two duets, "In the Garden" and "Saved by Grace". Note that there is an issue as to when B. F. Carter was born. 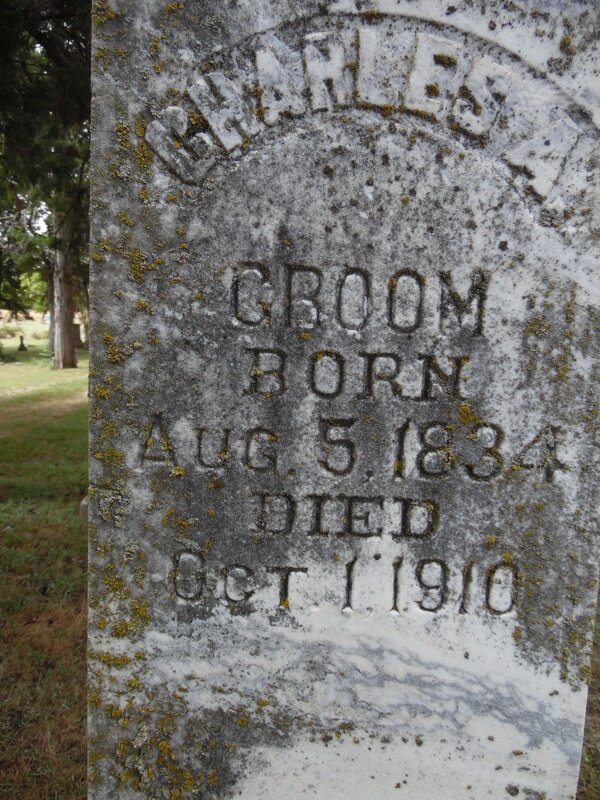 Based on his tombstone, it was December 9, 1875. His obituaryt, though, says 1878. The body of Ben F. Carter was brought from the soldier's home at Leavenworth, Kansas, to Table Rock, on Wednesday afternoon, and funeral services were held in the Christian church on Thursday morning, conducted by Pastor, R. A. Thompson; interment was made in Table Rock cemetery. 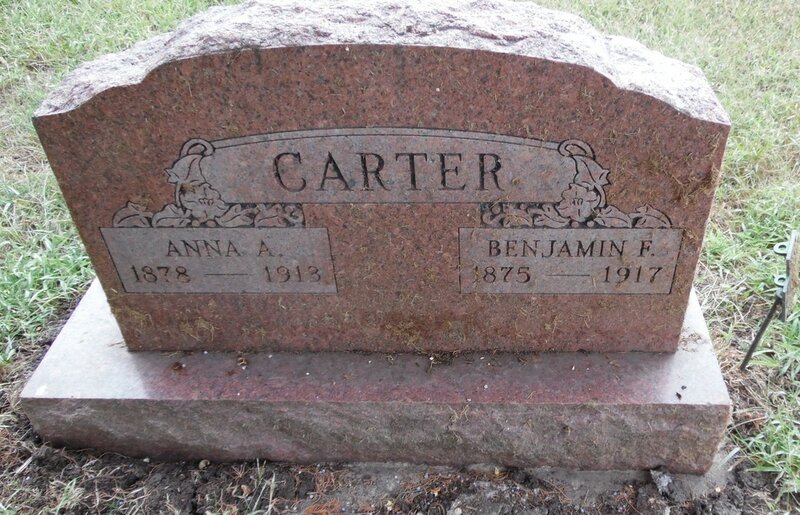 Benjamin Franklin Carter was born September 9, 1876, at Carpendale, Kansas, and died at the soldier's home. 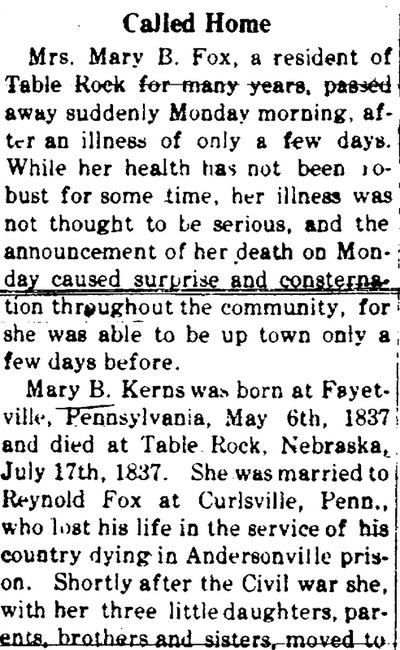 Kansas, April 23, 1917, aged 41 years, 4 months and 14 days. On November 27, 1901, he was married to Anna A. Shreck, at Pawnee City, Nebraska. To this union, one son Leonard was born. On December 28, 1913, his wife, Anna departed to the Great Beyond. After his wife's death he went to Kansas City, Kansas, and was injured at concrete work and since that time has been a sufferer for two years. In August, 1915, he was married to Hattie Proctor, of Kansas City, Kansas. He leaves to mourn his loss: His son, Leonard, a wife, father, mother and six brothers, Will Carter, Dawson; Sam Carter, Winner, S.D. ; J. 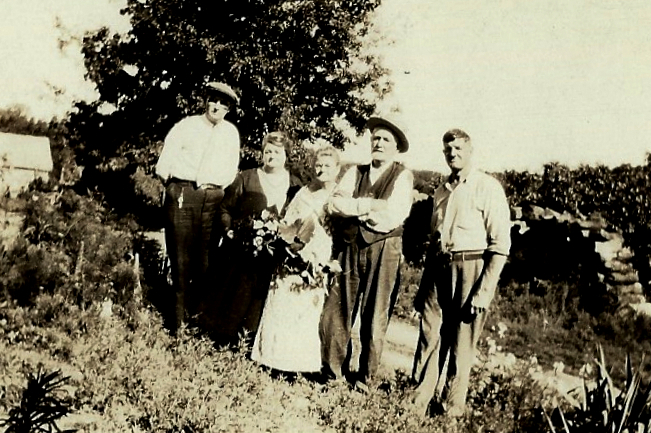 B. Carter, Table Rock; Harry Carter, Table Rock; Bert Carter, Lincoln, and Earl Carter, Gregory, S.D., also a host of other relatives and friends. Grace Alzina Boltjes, the daughter of Theodore and Eliza Alderman, was born July 12, 1892 at Elk Creek, Nebr. and passed away on Oct. 25, 1956, at the University hospital in Omaha at the age of 64 years, 3 months and 13 days. On Nov. 27, 1913, she was united in marriage to Harry B. Carter, and to this union two sons were born, Elmer A. of Omaha and Clifford F. of Englewood , Calif.
Mr. Carter passed away in 1918, and a few years after his death she and her boys moved to Wymore, Nebr., where on March 21, 1924, she was united in marriage to Henry Boltjes. The family moved back to Table Rock in 1925. She was an active member of the Table Rock Christian church, the Legion Auxilliary and the Table Rock Rebekah Lodge, having served as District president and district deputy president of the lodge. She was always ready and willing to help others, whenever her assistance was needed. She cared for her invalid husband until he was taken to the Veterans hospital two years ago. Her mother lived in her home for more than 30 years, having been blind for 15 of those years. She is survived by her two sons, Elmer and Clifford; a granddaughter, Sharon Carter, of Omaha; two sisters, Katie Hays of Table Rock and Maud Morton of Pawnee City; also five brothers, Will andRalph Alderman of Table Rock, George of Norfolk, Orville of Pawnee City and Emerson of Atchisonm Kans. ; and many other relatives and friends. Funeral services were held Sunday, Oct. 28, in the Methodist church in Table Rock and were conducted by Rev. W. N. Wallis of Pawnee City and sisters of the Table Rock Rebekah Lodge. Burial was in the Table Rock cemetery. Pall bearers were Charles Epley, Bob Epley, John Epley, Donald Epley, Donald Alderman and Jack Rademacher. Photo 2016, Marilla Chambers, from Kenneth Boyd collection. We know nothing about this little girl, other than that she died and was buried in the Table Rock Cemetery four years after her family returned to Nebraska. Clarence was the son of William M. and Marilla Atkinson Chambers, he was born on February 19, 1852 in Pennsylvania. He was married to Margaret E. Allison on November 19, 1872 in Pawnee City, Nebraska. They were the parents of four children: Grace, Macolmb, Mabel and Madge. After she died in 1881, he remarried; he was no longer in Table Rock at that time. He was cremated and the location of his ashes unknown. Table Rock Argus, Oct. 19, 1939. Again death has called at the Charles Chambers home. One year ago today Ruth was called. Then the 23rd day of June we laid Ward away. This last summons has come to the Husband and Father. Charles W. Chambers, son of William and Marilla Chambers, was born in Hawley, Penn. January 19, 1853, and departed this life October 14, 1939, having attained the age of 86 years, 8 months and 25 days. In 1857 his family came to Table Rock, Nebraska, remaining here about one year. They then moved back to Pennsylvania and again in 1867, when Charles was fourteen, they came to Nebraska, which has since been the Chambers home. On January 21, 1880, in Belle Plains, Iowa, Mr. Chambers was united in marriage to Miss Ida J. Kenner. For nearly sixty years they lived in this community, sharing the joys and sorrows of their lives. Just a short time before his death, he told his wife, his companion of so many years, how good and kind she had always been, a tribute that all who knew her will believe is true. He leaves, besides his wife, three sons, Chester of Eagle Creek, Oregon. Harmon of North Platte, Nebraska. James of Kingsburg, California; and five grandchildren. A daughter, Mrs. Ruth Wolfe, and a son Ward has preceeded him in death. For more than 20 years of Mr. Chambers life was spent in the employ of the Burlington System. Most of that time was spent at Table Rock and Pawnee City as station agent. He was in charge of the first Railroad Station in Pawnee City. Mr. Chambers was quite well known as a writer of short Articles, mostly of the earlier days, and won the commendation of the State Journal, and extended his acquaintanceship to to include the entire State. Children with Ida: Ruth Chambers (1880-1938); Henry Ward Chambers (1883-1938); Harmon A. Chambers (1889-1964); and James Richard Chambers (1895-1973). 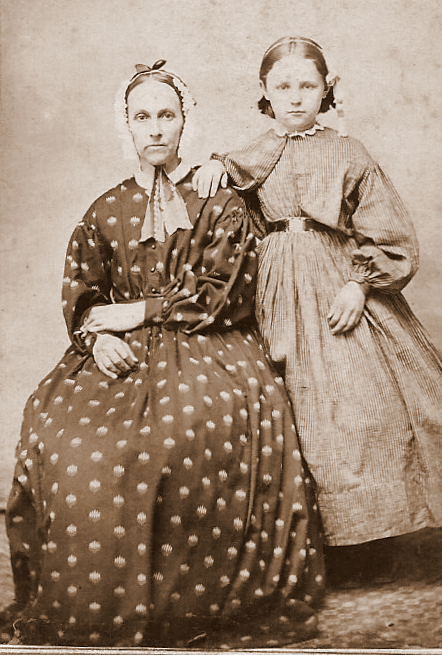 julia allison chambers (1855-1874), 1st wife of c. w.
A young Julia (on right) and her mother. Little is known of Julia. 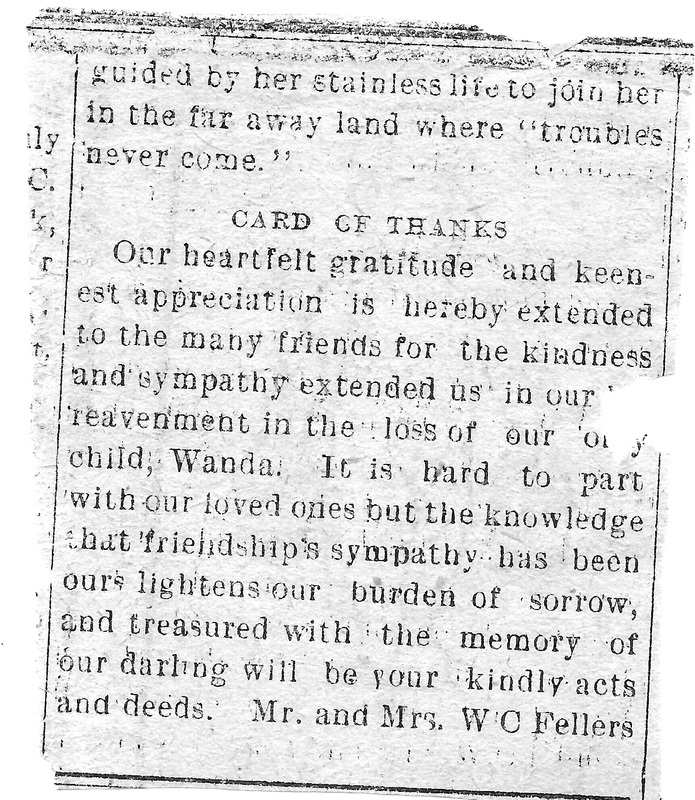 She and C. W. appear to have had a son, because Ida's obituary mentions a surviving stepson, C. L. Chambers of Estacada, Oregon. ida kenner chambers(1862-1948), ​2nd wife of c. w.
Curiously, C. W.'s obituary begins his married life in 1880 with his marriage to Ida. Did she and his children not know of Julia, who had died six years before? In any event, he was married to Ida for more than 60 years. TABLE ROCK ARGUS, Dec. 16, 1948. Fresno, California- Mrs. Ida J. Chambers died at the home of her son, James R. Chambers here December 9th. Burial was made in Table Rock, Nebr., Thursday, December 16th, with services at the Kovanda Funeral Home. Mrs. Chambers had been ill since October 1st, and had the added misfortune of breaking a hip in a slight fall on Armistice night. She had made her home in Fresno since the death of her husband, the late Charles W. Chambers, in 1939. Mrs. 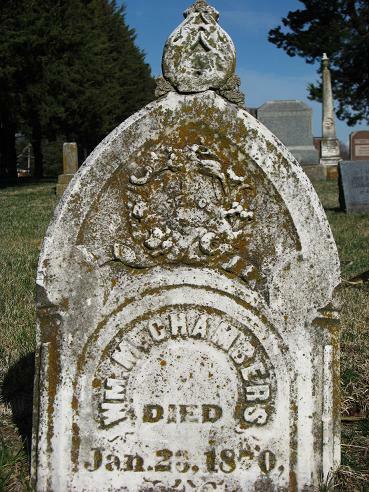 Chambers was born in Mr. Vernon, Iowa, the daughter of Richard and Lydia Kenner, April 22,1862. She spent her girlhood in Belle Plaines, Iowa, coming to Table Rock in 1880 upon her marriage to Mr. Chambers. Four children were born, two of whom have preceded her in death, these being Mrs. Ruth C. Wolfe and Ward M. Chambers. Harmon A. Chambers, North Platte druggist, and James, a Fresno printer-publisher, survive as do five grandchildren and twelve great grandchildren. A stepson, C. L. Chambers, resides at Estacada, Oregon. Mr. and Mrs. Chambers spent the greater part of their wedded life in or near Table Rock where Mr. Chambers was an early day telegrapher and station agent for the old Atchison and Nebraska which later became the C. B. & Q. , and for the Rock Island Lines in Pawnee City and elsewhere. Mrs. Chambers life, which began the second year of the Civil War, has encompassed almost nine decades of the greatest transition, growth, expansion and change experienced by the world at any time. In a small way she was a part of all this and until the end, held a keen perception and interest in those things transpiring. Her heart was in the Plains of the Midwest though her infirmities made necessary living her life's end elsewhere. Table Rock Argus, Jan. 25, 1912. The funeral exercises of Thomas W. Conklin, who died at his home in Bird City, Kansas on Tuesday morning, were held in the M. E. Church Thursday morning at ten-thirty, being conducted by the Rev. Howard P. Young, pastor. The remains were laid to rest beside those of his first wife in the Table Rock cemetery. Mr. Conklin came to Table Rock from Pennsylvania in 1879. He lived in town and vicinity for twenty-three years forming many acquaintances through-out the country. He was born in Susquehanna county, Pennsylvania in 1837 and died at Bird City, Kansas January 16, 1912, aged 74 years, 8 months and 2 days. On February 25, 1861, he was united in marriage to Mrs. Julia Billings, who died June 14, 1901. To this marriage four children were born, Matilda R., Ruby A., William A. and Maud I., all of whom were present at the funeral, except William A. who lives at Galt, Calif.
After the death of his first wife he was twice married, the last time to Mrs. Mary Bennet , of Table Rock who survives him and with the daughter Maud, accompanied the remains to Table Rock. In 1902 he moved to Smith county, Kansas, where he resided until 1907, when the family moved to California, but returned to Kansas in 1909, living in Bird City, where he engaged in the restaurant business. ​He was a good husband and father, a good citizen and many friends sympathize with the widow and children in their loss. Mrs. T. W. Conklin died at her home in this city, at 10:40 o'clock Friday forenoon, after an illness of only a few days. She was taken ill on Monday night, with malarial fever, on Wednesday and Thursday there were stomach complications, and it was known that she was very sick, but still her friends were not apprehensive of fatal results. Friday morning she grew worse, and although everything possible was done for her relief, she passed away. The funeral services were held in the M. E. church at 10 o'clock morning, conducted by her pastor, Rev. Shamel, who returned from Missouri in time to be present at the last sad rites, then the remains were laid to rest in the Table Rock cemetery. Julia Bidwell was born in Salem, Wayne county, Pennsylvania July 4, 1840, and died June 14, 1901. She was married to Lorenzo Billings October 17, 1856, who died in May, 1859; to this union two children were born, Anna M. Brooks, now living in Chicago, and Emma E., who died at Clear Creek, Oct. 16, 1876. She was married to Thomas W. Conklin February 25, 1861; to this union four children were born, one son and three daughters: W. A. Conklin, Mrs. O. W. Griffing, Mrs. F. H. Taylor and Miss Maude Conklin, all of whom reside in Table Rock. ​She had been a member of the M. E. church since 1857. She was a devoted wife and loving mother, and will be sadly missed from the family circle and from the community. Photo 662, Lou and Will Conklin, donated by Ines Madden, Lou's niece. The lovely couple above were born in Table Rock, lived in Table Rock, had a store in Table Rock, and moved to California in1891. lived Lou died there and Will married Lillie Daisy (Culwell) Conklin. Lou and Will are buried together in California. 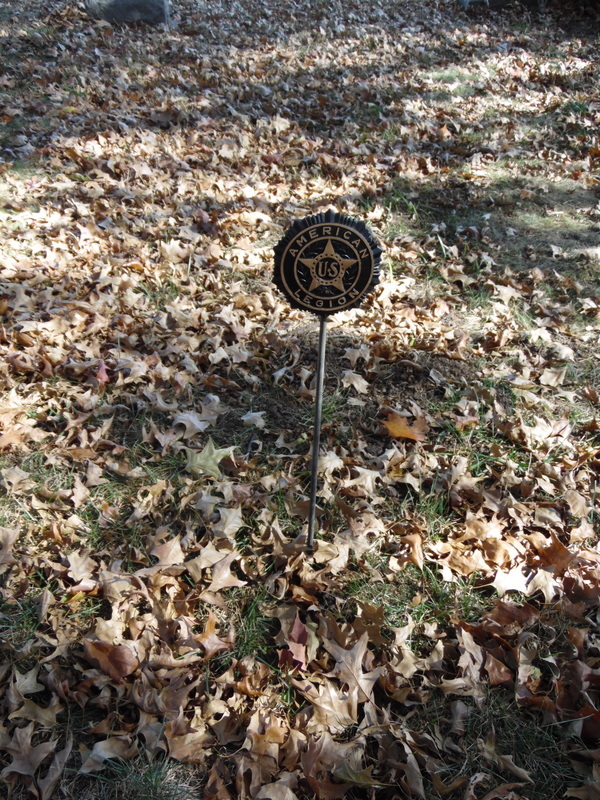 Daisy is buried in Sheridan at Auburn with her first husband, also named William Conklin! Luella Hinrichsen, who sorted this out says, "I don't know if the two William were cousins or not, but how weird is that? Anyway I thought it was interesting!" 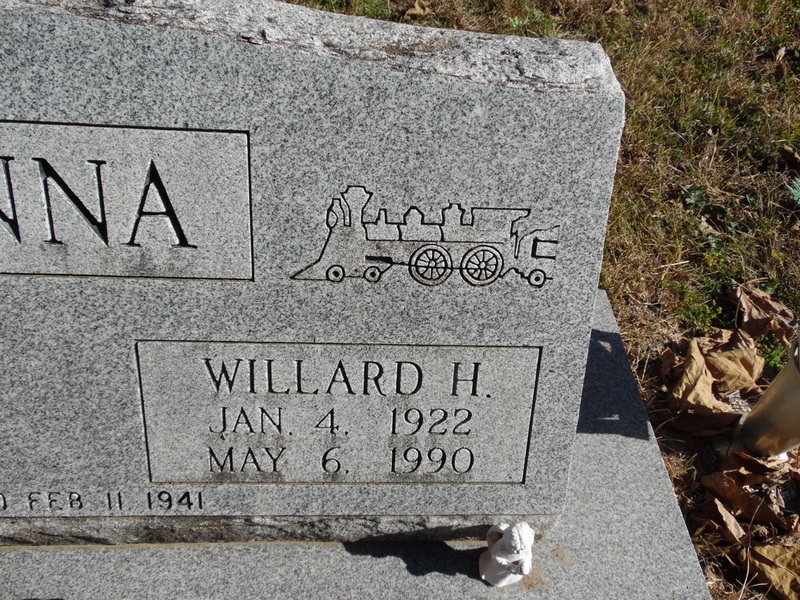 Luella also pointed out that Will's parents are buried in Table Rock. TABLE ROCK ARGUS, Table Rock, Nebraska, December 23, 1927. Mrs. Lulu Conklin of Galt passed away at her home on Fifth street at 7 o'clock Wednesday morning November 30, 1927, at the age of 64 years and 4 months, from heart trouble, after an illness of just a few days. Mrs. Lulu Conklin was born in Table Rock, Nebraska, in 1873, was married to Mr. William A. Conklin at that place in 1891 and moved to Galt in the year 1907, where they have resided ever since. She was a very prominent social and religious worker in this community, being directress of the local Methodist choir for many years and taking a very active part in all local musical events. She was a tireless worker in all religious matters, and was ever ready hand willing to lend a helping hand to those in need. She leaves to mourn her loss besides her husband, Mr. William A. Conklin of this place, a brother, Mr. Francis M. Linn, of Roseville, California. Funeral services will be held today (Friday, December 2) from the Galt Methodist church at 2 o'clock in the afternoon, with Rev. J. A. Heetebry officiating.- Galt, California Herald. Mrs. Lulu Conklin Buried.- Word has been received that funeral services were held at the M. E. church at Galt, California for Mrs. Lulu Conklin, wife of W. A. Conklin, former residents of Table Rock. She had not been feeling well for some time but no apprehension of a serious result was felt until a few days before her death. The remains were taken to Sacramento and placed in a crypt in a mausoleum in a beautiful cemetery at Sacramento. This arrangement had been planned by Mr. and Mrs. Conklin long before her death, the arrangement including that when Mr. Conklin passes on his remains shall rest beside her. 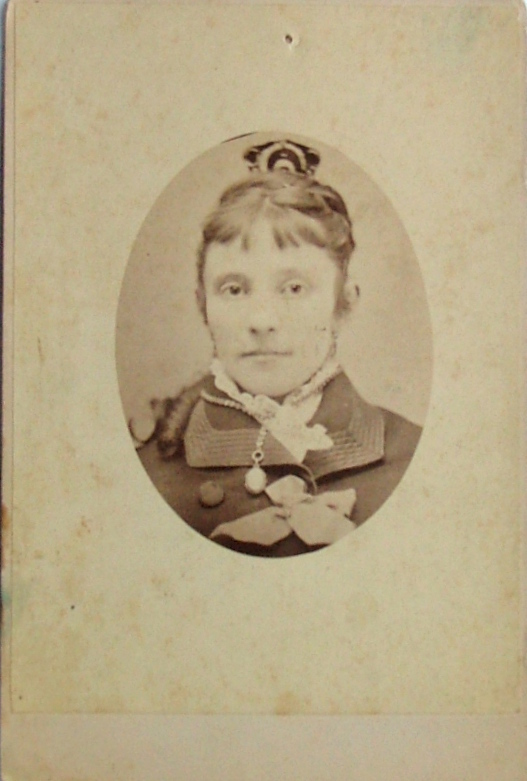 Mrs. F. H. Taylor received a telegram Sunday morning that her brother, Wm. A. Conklin of Galt, California, had died at 2 a.m. that morning at a hospital in Sacramento. Mr. Conklin came to Pawnee County with his parents in 1879; he lived on a farm here and near Tecumseh until he reached man's estate; then he learned the printers trade at Tecumseh; after which he opened a store in Table Rock, which he operated until about 25 years ago when he removed to California and settled at Galt. He lived there until his death. ​He was united in marriage to Lulu W. Linn December 22, 1891. She passed away in November 1927. In May 1929, he was married to L. Daisy Conklin of Auburn. On Saturday night, June 7, he fell and broke his hip and it is supposed he had a stroke of paralysis. He was removed to the hospital where he died as above stated. He was 69 years of age at the time of his death and has not been in good health for some years. He leaves a widow, one step-son, James Conklin of Auburn; three sisters, Mrs. Mattie Griffing of Endicott, Mrs. Maude Ruhnison of Bird City, Kas., and Mrs. Ruby Taylor of Table Rock. Will was an honest Christian gentleman, and had a large circle of acquaintances and friends among the people of Table Rock. TABLE ROCK ARGUS, March 25, 1932. There was mourning in many Table Rock homes on Friday morning when it became known that Mary A. 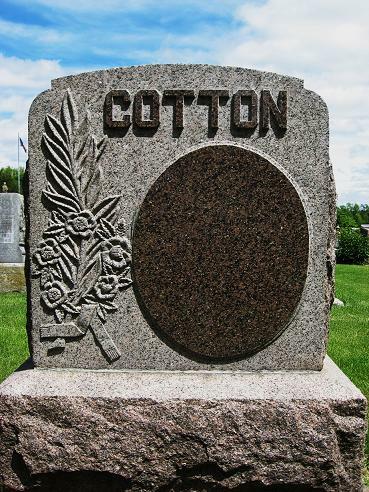 Cotton had died at the McCrea hospital about10:30 o'clock that morning. She had been an invalid for some weeks and while the years of her pilgrimage on earth had been many her friends were hopeful of her recovery. She passed away as she lived, a sunny, happy disposition. On the occasion of her eightieth birthday she called me to her bedside, a smile played over her face as she said, "I suppose my sunny, girlish days are over." but she was thinking of her eighty years of life not of the body or spirit. All who knew her loved her, her children and grandchildren loved her and there will be aching hearts because of her passing for her life was full of sunshine and helpfulness. 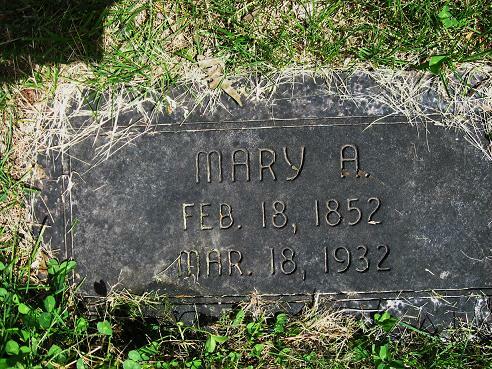 Mary Adeline Cullens was born on February 18, 1852, near Freeport, Illinois, and died March 18, 1932, aged 8 years and 29 days. She is the last of a family of five children. Thanksgiving Day, 1873, she was united in marriage to George F. Cotton, who died at Los Angeles in December, 1915. To this union six children were born, four boys and two girls. One girl and one boy died in babyhood, and Fred at the age of twenty. The children surviving are George A. of Hemmingford; Nellie C. of Las Vegas, Nevada, and Ralph C. of Table Rock. The family came to Table Rock in 1893. Since then the home has been at Table Rock with the exception of five years at Seward. Early in life she united with the Methodist church and remained a member until her death. She was uncompromising toward anything that would weaken influence of the church. Cotton and Frances and Mazie Martin. Her outstanding characteristic was her cheerful and sunny disposition. She always looked on the bright side of everything, even in face of sorrow. She often said we should count our blessings and be thankful for them. Mrs. Cotton was also a member of the Sunday school, the Missionary society, the W.C.T.U., Eastern Star and W.R.C. She was a faithful worker and will be greatly missed. Funeral services were in the M.E. church at 2:30 o'clock Sunday afternoon by Rev. W. E. Caldwell. The sermon was a beautiful tribute to the memory of the deceased and to the faith she had in God and lived with such fidelity through the long years of her life. The beautiful song "Crossing the Bar. " was sung by Gaylord Wilson, accompanied on the piano by Mrs. Wilson. A mixed quartette composed of Rev. 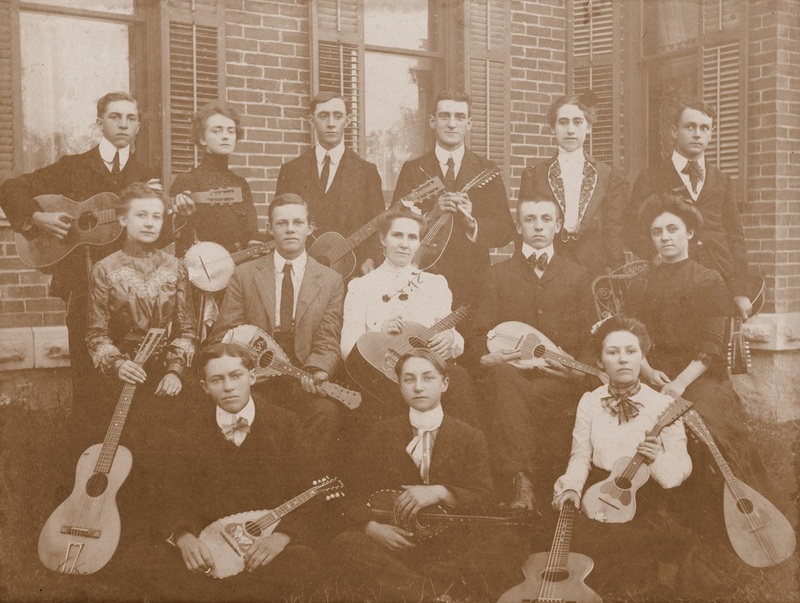 Caldwell, Mrs. Taylor, H. G. Pattison and A. L. Ogden, accompanied by Mrs. H. Johnson at the piano and Laurence Sites on the violin, rendered two old favorite songs, Mr. and Mrs. Cotton had sung through the years of their life together. Floral tributes were beautiful. Burial was in the Table Rock cemetery beside her husband. She leaves a precious memory as woman, wife and mother. George Cotton is referred to as Col. Cotton in articles such as this 1900 Argus social. We haven't yet found a record of military service. George Francis Cotton was born June 6th 1846 at Taylor, Courtland County, New York and died in a hospital in Los Angeles, California, December 5th, 1915. When about eighteen years old he came west to Manchester, Iowa, and thence removed to Clark City, Mo. He was married on November 29th 1873 to Mary A. Cullen. For some time after his marriage he had his home at LaHarp, Ill. Here he was converted and united with the Methodist Episcopal church, under the ministry of the Rev. C. H. St. John. In 1884 he brought his family to Nebraska and settled in Superior. Mr. Cotton and his family came to Table Rock in 1893 and this city has been his home all the intervening years, except for five years which he spent at Seward engaged in the brick business, and during all these years he was intensely interested in the prosperity of the town, never wavering in his loyalty and giving liberally both in time and money to develop her material resources, and he was willing to make personal sacrifices that the community interests might be advanced. He had great faith in the brick possibilities of our clay hills and believed the time would come when they would be developed and made the avenue of a great commercial industry, and his life work having been along these lines his opinions and faith were an inspiration to others. As an employer of men he always had the respect and esteem of his employees because of his uniform kindness and genuine interest in their welfare. As a husband and father he was tender loving and kind, the wife and children being the supreme care of his life. As a friend he was faithful and true, and no demand of friendship was ever neglected by him. He loved young people and children, and these loved him in return, and there is sorrow in many young hearts because "Uncle George" has passed away. As a citizen he was public spirited and will be greatly missed in the community life. He walked ostentatiously doing the duties of life simply, yet he was emphatic and stood without compromise for what he believed to be right. Mr. Cotton was a Knight Templar Mason, and a member of Lincoln Shrine; he had also taken all the Odd Fellow degrees including the Patriarch Militanta and was a member of the Ancient Order of United Workmen, and these orders were all represented at the funeral services. In this connection it will be of interest to many to know Mr. Cotton, Mr. C. H. Norris and Mr. M. H. Marble were the building committee having in charge the construction of the Odd Fellows building standing on the southwest corner of the public square. 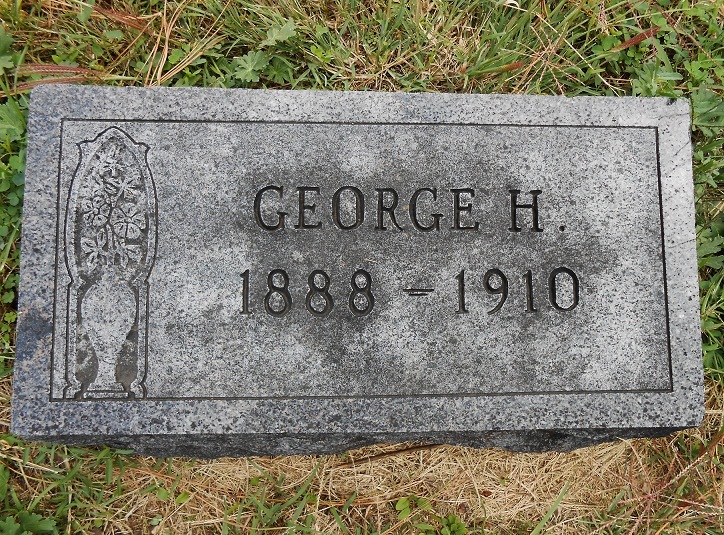 He is survived by his wife and three of his six children, George A. Cotton and Ralph C. Cotton of Table Rock, and Mrs. Nellie Martin of Las Vegas, Nevada. At the time of his death he was a member of the Methodist Episcopal church in Table Rock. Funeral services were held at the Methodist church last Thursday afternoon conducted by the pastor Rev. A. E. Chadwick, he chose as his text "The righteous hath hope in his death." Prov. 14:23and interment was in the Table Rock cemetery. 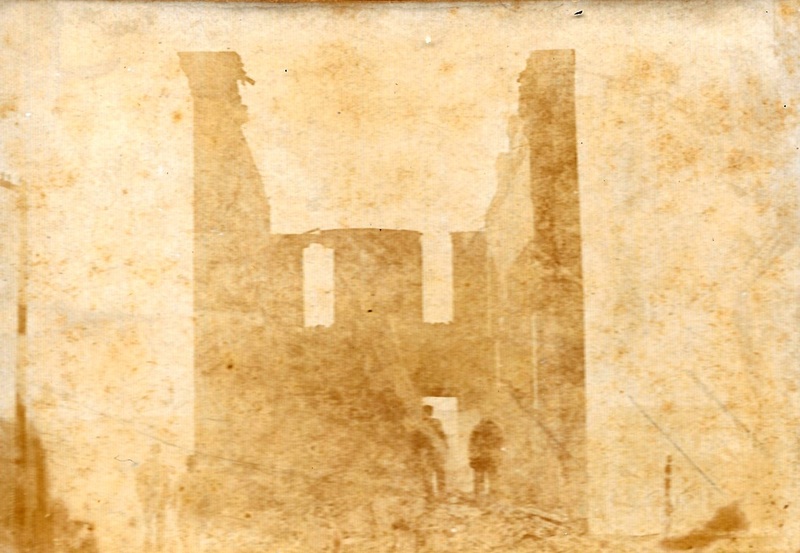 The first Odd Fellow Building burned down in 1901. 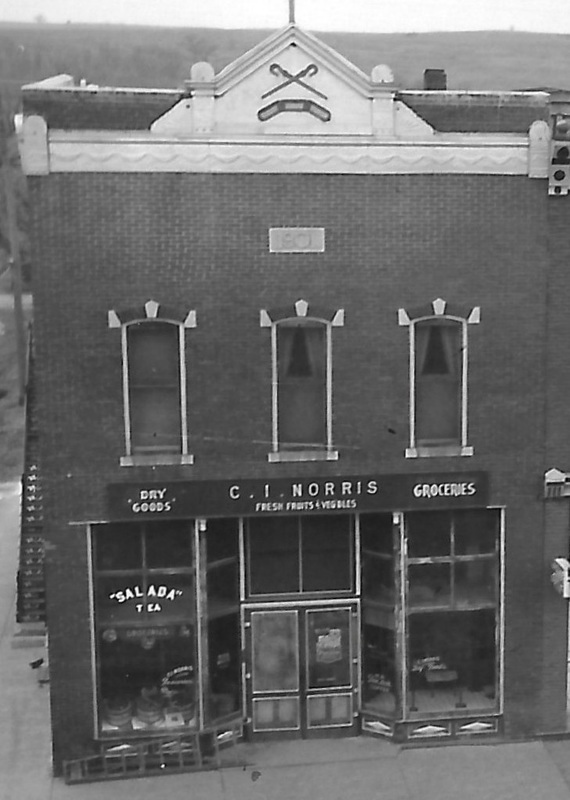 The present Odd Fellows building (seen here in 1941) was immediately rebuilt in the first building's footprints. George was on the building committee. TABLE ROCK ARGUS, FEB. 11, 1943. GEORGE A. COTTON, FORMER LOCAL DRUGGIST PASSES AWAY AT ALLIANCE HOSPITAL. OBITUARY- George A. 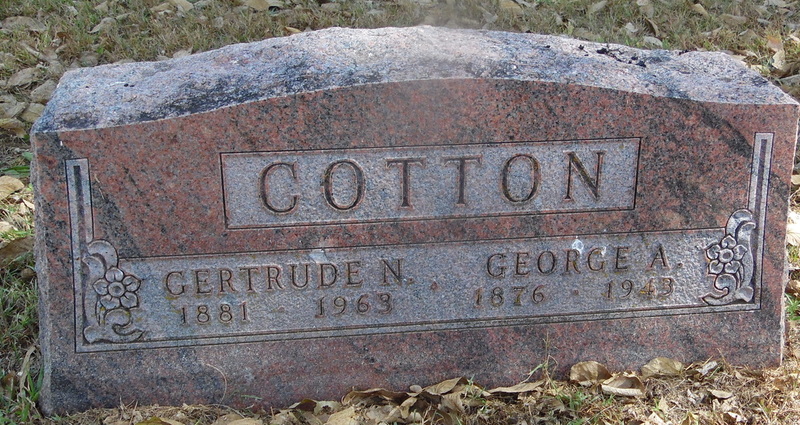 Cotton, son of George F. and Mary A. Cotton, was born at La Harpe, Ill., October, 22, 1876 and died at the hospital at Alliance, Nebr. on February 6, 1943. The family located in Superior, Nebr. in 1884. In 1893 they moved to Table Rock. In 1902 Mr. Cotton graduated from the Highland Park pharmacy school of Des Moines, Iowa, and four years later he entered the drug business in table Rock, continuing until 1915. After spending four years in the drug business in Brush, Colorado,he purchased the drug store at Hemmingford, Nebraska, and continued in business there until his death. He was known as a druggist of high integrity and conscientious in the practice of his profession. He was a member of the Masonic Lodge of Table Rock. He leaves his wife, Gertrude, one brother, Ralph C. of Lincoln, one sister, Nellie C. Martin of Las Vegas, Nevada, and many who will remember him as a dependable druggist. Funeral services were held Tuesday afternoon at the Methodist church her. Rev. W. H. Merrill, pastor in charge, and burial was on the family lot in the Table Rock cemetery. Mrs. Gertrude Cotton, daughter of Chauncey H. and Fannie Giddings Norris, was born in Table Rock, Nebraska on February 18, 1881. Mrs. Cotton was united in Holy Matrimony in 1912 to George Cotton of Table Rock and operated the drug store here for a number of years. As the last living member of her immediate family, Mrs. Cotton left this life on September 18, 1963, at the age of 82 years and 7 months. while living at the Gordon Home in Pawnee City, Nebraska. There are a host of nieces and nephews surviving to mourn her passing. Mrs. Cotton came from an ancestry of active church workers. Her grandfather, the Rev. Charles Giddings was a Methodist Circuit Riding minister in this area. Mrs. Cotton's past has been an active relationship with the church. Mrs. Cotton was active as secretary in the WSCS, a member of the Table Rock Methodist Church since 1907 and has been very active for nearly 56 years. Close friends of Mrs. Cotton remember her attending church in bad weather, never missing a Sunday, even though she was a victim of Parkinson's Disease. She was also active in the local chapter of the Order of the Eastern Star. She would have received her 50-year OES pin next April. This photo was taken in 1910 in front of the home of Gertrude Cotton's parents, two years before her marriage. Her future husband is not in the group, but George's siblings Ralph and Nelle are. Ralph is in the middle row, 4th from the left, and Nelle is fifth from the left. Ralph & Nelle are not buried in Table Rock. However, Gertrude's parents Chauncey & Fannie Norris are. Photo 192. John Lewis Covault and Zella Aylor wereboth bornin Van Buren County, Iowa, he in 1860 and she in 1863. They married in 1882.They had five children. One died infancy. The other four were Elizabeth Covault Morris, John Covault, Clarence Covault, and Lucy Covault Mertes. In 1912, they moved to Table Rock. Both are buried there. John Lewis Covault was born October 6, 1860 in Van Buren County, Iowa and died at his home in Table Rock, Nebraska, July 17, 1936 at the age of 75 years, 9 months and 11 days. He was united in marriage to Zella Aylor, October 18, 1882. To this union five children were born. Elizabeth Morris of Crab Orchard, John and Clarence of Table Rock and Mrs. Lucy Mertes of Table Rock, one child died in infancy. He came to Nebraska immediately following his marriage, living one year near Peru, one year in Johnson county and the remaining years until they moved to Table Rock in 1912 were spent on the farm north west of Table Rock. He united with the Baptist church at the age of 20, later uniting with the Christian church at Table Rock, always maintaining an active interest until his death. He was proceeded in death by his parents, Alexander and Elizabeth Covault and two sisters, Millie who died at the age of three years and Mrs. Hanna Halverstaldt, who passed away several years ago. He leaves to mourn his passing his wife, four children, 10 grandchildren and 4 great grandchildren. He was a good neighbor and a loving husband and father. His devotion to his wife and family were out standing and his happiest hours were spent with his children and grandchildren gathered around him. Mr. and Mrs. Covault celebrated their Golden Wedding Anniversary at their home here October 18, 1932. Funeral services were held at the Christian Church in Table Rock on Sunday morning July 19th at ten o'clock in charge of Rev. E. M. Pardee of Lincoln, former pastor here, and the interment was in the Table Rock cemetery. Zelle Belle Aylor was born in Van Buron County, Iowa, July 19, 1863. and died at the Pawnee City hospital, September 12, 1948 at the age of 85 years, 1 month and 24 days. She was united in marriage to John L. Covault at Keosauqua, Iowa October 18, 1882. To this union were born five children, Elizabeth, wife of Sam Morris, living at Crab Orchard; John and Clarence of Table Rock vicinity, and Lucy, wife of Edd Mertes, also of Table Rock. One child died in infancy. Mrs. Covault came to Nebraska with her husband shortly after their marriage, living one year at Peru, one year in Johnson County and then moved to a farm between Table Rock and Elk Creek where they lived until 1912. At that time they moved to Table Rock where Mr. Covailt passed away July 17, 1936. Two years ago, her failing health made it necessary for her to give up her home and she has made her home with her children since that time. She united with the Baptist church in early girlhood, later becoming affiliated with the Christian church at Table Rock, where she was a faithful attendant and worker until the time of her death. 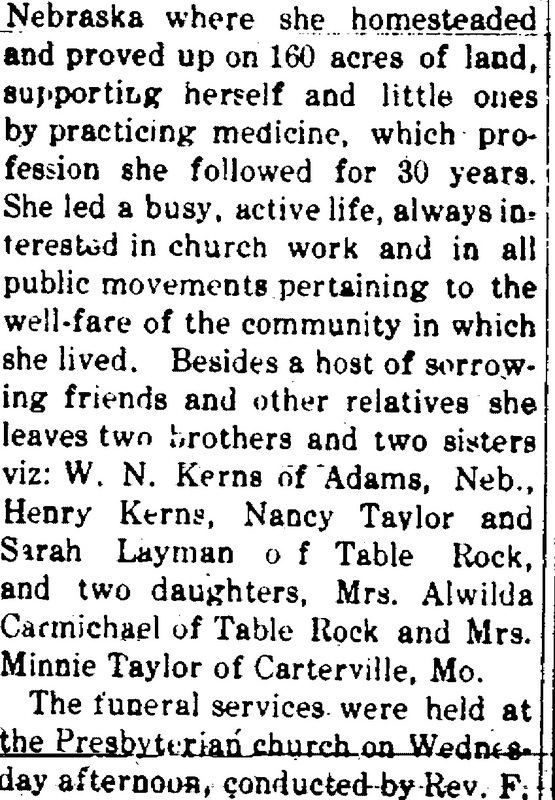 Left to mourn her passing are her 4 children and 13 grandchildren; also 2 brothers, John Aylor and Norris Aylor, both of Table Rock, and 1 sister, Mrs Ella Mort of Table Rock, and a host of other relatives and friends. Table Rock Argus, Oct. 9,1958. Funeral services were held Sunday afternoon at the Wherry Chapel in Table Rock for Mrs. Elizabeth Morris, 74, who passed away in Bryan Memorial Hospital in Lincoln last Thursday. Officiating at the final rites was the Rev. Malia, pastor of the Christian Church in Pawnee City. Interment was made in the Table Rock cemetery. 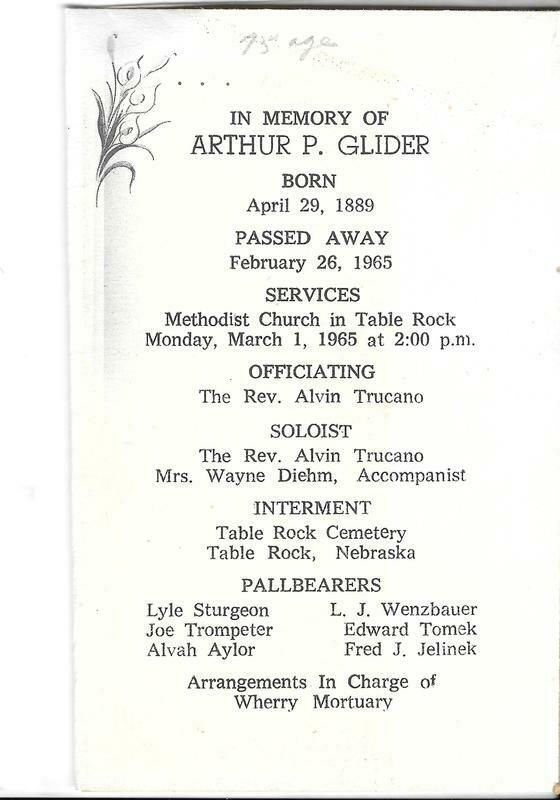 Singers at the funeral were Ardyce Freeman and Alice Kotalik, accompanied at the piano by Mrs. Elva Covault. 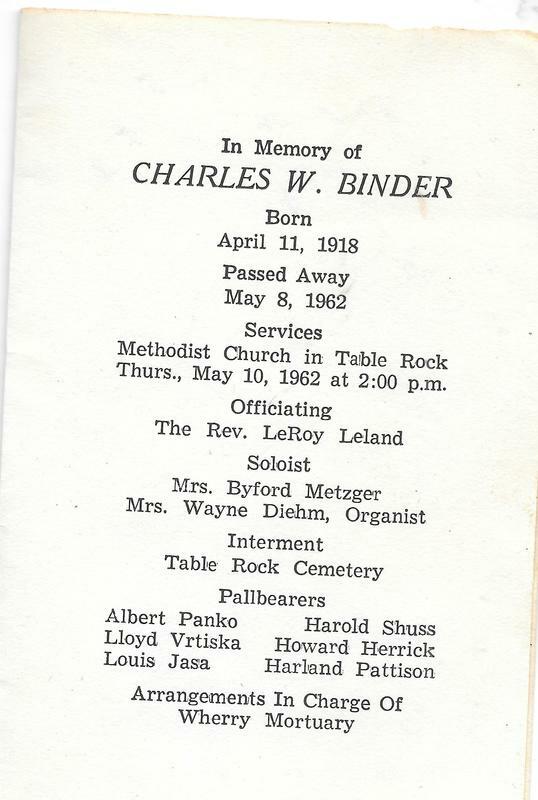 Pallbearers included Clement Hubka, Edgar Gilbert, Frank Sochor, William Vondrasek, Edgar Norris and Edmond Steiner. Born in Peru, Nebraska on March 2, 1884, she united in marriage on October 2, 1902 to Samuel R. Morris. They lived near Table Rock for a few years, and at Lewiston and Crab Orchard before retiring to live in Table Rock about six years ago. Mr. Morris died on January 26, 1956. Mrs. Morris submitted to an operation on November 12, 1957, and re-entered the hospital in March of this year. she than lived with her son, Charles in Lincoln for only four months before it was necessary for her to again enter the hospital, where she passed away on October 2nd. Surviving her is her son, Charles Robert of Lincoln and two grandchildren; two brothers, C. W. Covault and John Covault, and one sister, Mrs. Ed Mertes, all of Table Rock. Table Rock Argus, Jul. 4, 1972. John Alexander Covault, oldest son on John and Zella Covault, was born on a farm between Table Rock and Elk Creek on Paril 7, 1886 and died June 28, 1972 at the age of 86 years, 2 months and 21 days. He lived on the farm with his parents until his marriage to Miss Bessie Herrick on January 10, 1906. After several years on the "Dewey Place" they purchased the present farm home a mile north of Table Rock. Six children were born to this union: Lloyd of Table Rock, Richard of David City, Veda Howell, and Wayne of Table Rock, Delmar of Pawnee City, and Lillian Bowen of Table Rock. His wife Bessie died on May 18, 1948. On November 14, 1940, he married Mrs. Myrtle Dean of Lincoln and the couple occupied the farm home for a number of years. John's health failed, and since March 7th, 1965 he has made his home at the Howell Hotel and has been cared for by his daughter, Veda and her family and his son Wayne, who are residents of the hotel. The other children helped out whenever possible in the care of their father. John had been a member of the Church of Christ in Table Rock since early boyhood. During the years, in spite of his failing health, he rarely missed being in his place at the Sunday morning service. He is survived by his wife, Myrtle, six children, 12 grandchildren, 15 great-grandchildren; one brother, Clarence Covault of Table Rock; one sister, Mrs. Lucy Mertes of Pawnee Village; and a number of nieces, nephews and other relatives. One sister, Mrs. Sara Morris, preceded him in death in 1956. There is no vision but by faith. 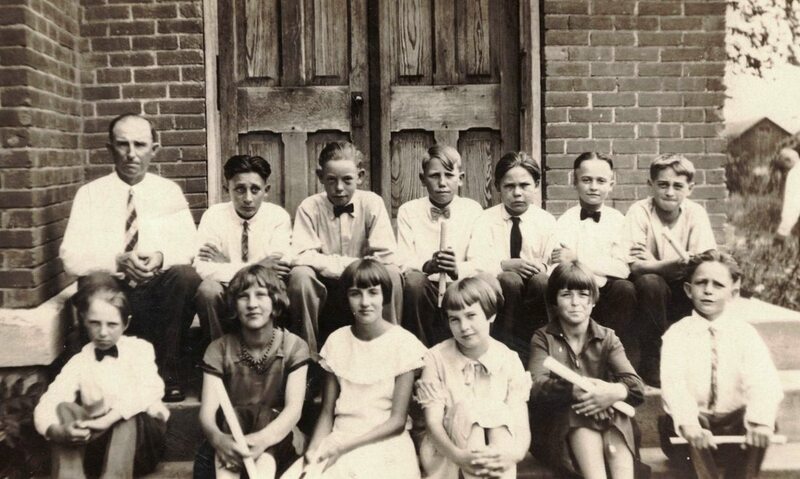 In 1928, John Alexander Covault and his Sunday school class at the Christian Church. His son Wayne Covault is in the front row, far left. Leonard Mertes, son of John's sister Lucy, is in the back row, second from the right. Photo 1771, shared by Brad Bowen. Table Rock Argus, May 20, 1948. Funeral services were held this Thursday afternoon for Mrs. John Covault, 62, who passed away at the Pawnee County Memorial Hospital May 18th after a lingering illness. Funeral services were held at the Christian Church and burial was made in the Table Rock cemetery. Lillian Bessie Herrick, youngest daughter of William D. and Mary Herrick, was born February 22, 1886 on a farm in the Clear Creek community. At the age of fifteen, her mother died and she lived with her sister, Lola. Here she grew to womanhood. On January 10, 1906, she was united in marriage with John A. Covault of Table Rock. They made their home on a farm near here. To this union were born six children. About three years ago her health began to fail. All that medical skill and loving care could do in her behalf was bestowed upon her. She closed her journey on this earth May 18, 1948, at the Pawnee Hospital at the age of 62 years, 2 months and 26 days. Leaving to grieve this loss are her husband at home, two daughters, Mrs. Lillian Giles, at home, and Mrs. Veda Howell of Table Rock; four sons, Lloyd, on a farm near the home place, Richard of David City, Wayne at home and Delmar, also farming near the home place; also 8 grandchildren; one brother, Murray Herrick, and one sister, Mrs. Lola Phillips, both of Table Rock, and several nieces and nephews. Many close friends who have known her through the years, also mourn her passing. Mrs. Covault was a deeply spiritual woman and had been a faithful member of the Christian Church in Table Rock since early girlhood. All through the years she and her family were always found in their accustomed places at all services of the church. Hers was a beautiful life dedicated to righteous purpose and service to others. "And God shall wipe away all tears, and there shall be no more death, neither sorrow, nor crying; neither shall there be any more pain for the former things are passed away." In 1928, the Ladies Aide Society at the Christian Church. 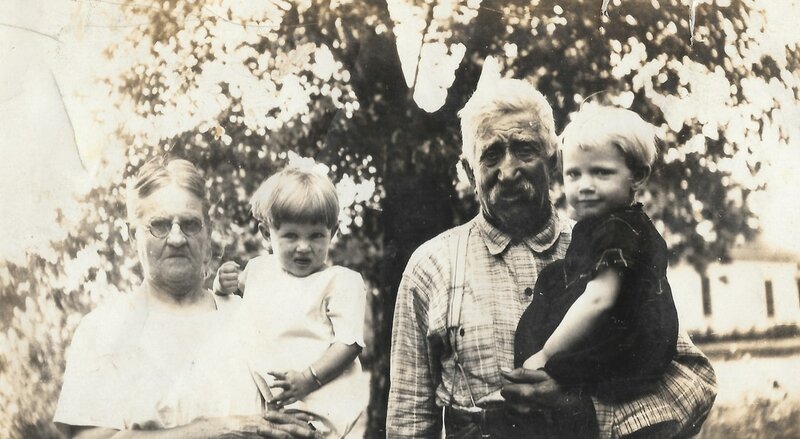 On the far left is ____ Covault holding baby Jean. On the far right of the ladies is Bessie Covault, wife of John A. Covault. 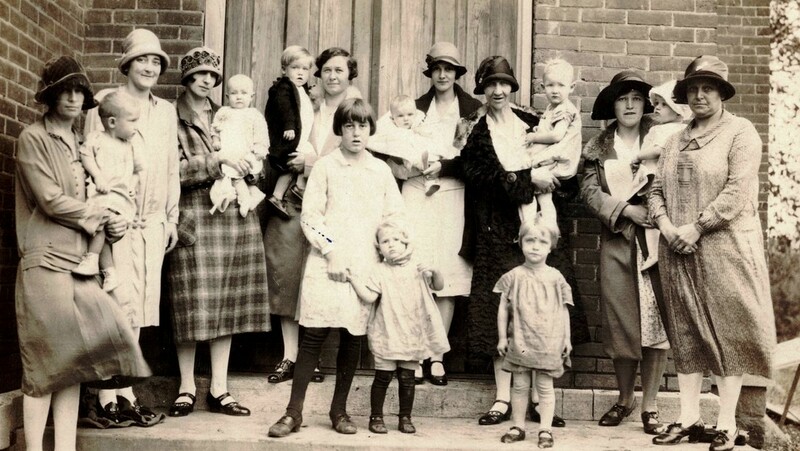 The child on the far right (of the three children standing in the front) is Lillian Covault Giles Bowen, the youngest of John & Bessie's six children: Lloyd, Richard, Veda, Wayne, Delmar, and Lillian. Lillian was to marry LaVelle Giles just before he left for service in World War 2; he was killed. She then married Johnny Bowen. Photo 1770, shared by Brad Bowen. Alice Marie Taylor Covault, 98, Pawnee City, died Thursday, June 20, 2002, at the Pawnee Manor in Pawnee City. She was born Sept. 12, 1903, to Edmund D. and Avis (Dopp) Taylor in a farm house two miles southeast of Table Rock. She graduated from Table Rock High School in 1921, attended Wesleyan College in Lincoln for one year, and later attended Peru State College. She taught in several rural schools near Table Rock and near North Platte, at Davenport and in Steele City. From 1948-1968, she taught at Table Rock Public School, and also taught an adult Sunday School class for a number of years. On June 2, 1928, she married Lloyd E. Covault at the farm house where she lived from 1928-2000. During her youth, she enjoyed riding fast horses and ice skating. She had been a member of the Church of Christ in Table Rock for 74 years. 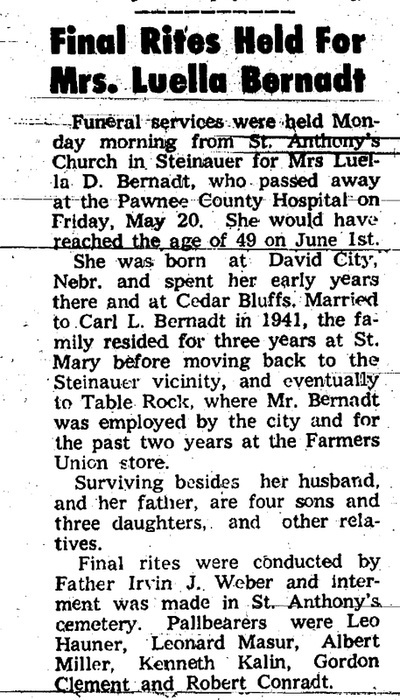 She was the mother of four sons: Lavon, Leland, LeRoy, and Larry. Larry E. Covault, age 75, of Lincoln, Nebraska, passed away on Friday, January 13, 2017 in Lincoln. Larry was born January 13, 1942 to Lloyd and Alice (Taylor) Covault in Pawnee City, Nebraska. Larry attended Table Rock Elementary and High School graduating in 1960. He was a lifetime member of Saint Paul United Methodist Church. He attended Lincoln School of Commerce and the Culinary Art School majoring in food service. He was employed in food service for 31 years at the University of Nebraska. Larry loved the Nebraska Huskers and traveled to many out-of-town and bowl games. He also was a fan of Kansas University basketball and the New York Yankees. He had a passion for weather forecasting and the Nebraska Lottery. Larry is survived by: his brothers, LaVon (Gleora) and Roy (Jan); sister-in-law, Norma; and several nieces and nephews. He was preceded in death by parents, and brother, Leland. Memorial Service on Friday, January 20, 2017, at Roper and Sons Chapel, Lincoln. Private family burial in Table Rock Cemetery. Table Rock Argus, May 30, 1974. Mrs. Veda Howell died Sunday morning, May 26, in St. Elizabeth Hospital in Lincoln, where she had been a patient for the past nine weeks, while under going surgery. She was 62 years of age. Mrs. Howell had operated the Howell Hotel here for more than twenty years, including the operation of a cafe in conjunction, during the first few years of their operation. She was a member of the Church of Christ, in which she was active as a church member and in its organizations. Funeral services wee held at the Church of Christ Wednesday afternoon with Kenneth Cooper, minister officiating. Burial was in the Table Rock Cemetery. Soloist were Jon Covault and Frank Petrashek with Allen Covault as pianist. Pallbearers included her nephews: Leland, Larry, LeRoy, LaVon and Rodney Covault and Greg Bowen. 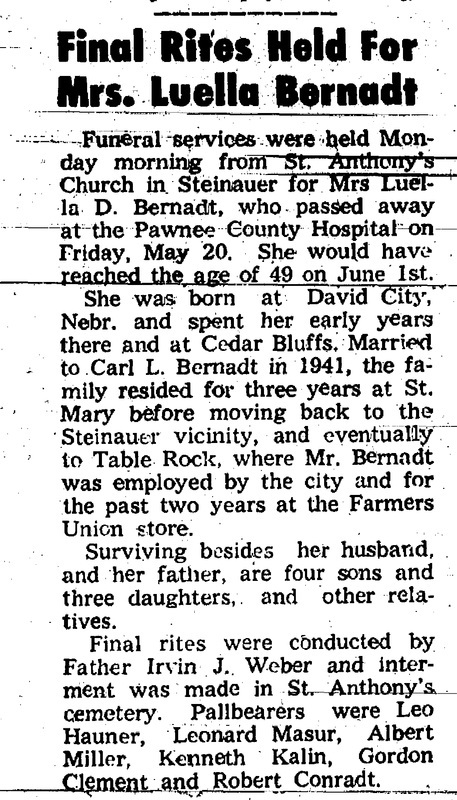 Veda Arlene Covault, daughter of John and Bessie Covault, was born on a farm north of Table Rock, Nebr. on May 20, 1912 and died May 26, 1974, just 6 days after her 62nd birthday. She and lived in this community all her life and graduated from Table Rock High School in 1930. On May 27, 1935, she was married to Howard Howell. One daughter Ardyce, now Mrs. Robert Freeman, was born to this couple. Veda was a member of the Church of Christ in Table Rock and taught Sunday School for many years. She had served as president of the Aid Society and was involved in all activities of the church. She was taken ill on March 25th and spent two days in the Pawnee County Hospital before being transferred to St. Elizabeth Hospital in Lincoln where she passed away May 25th. 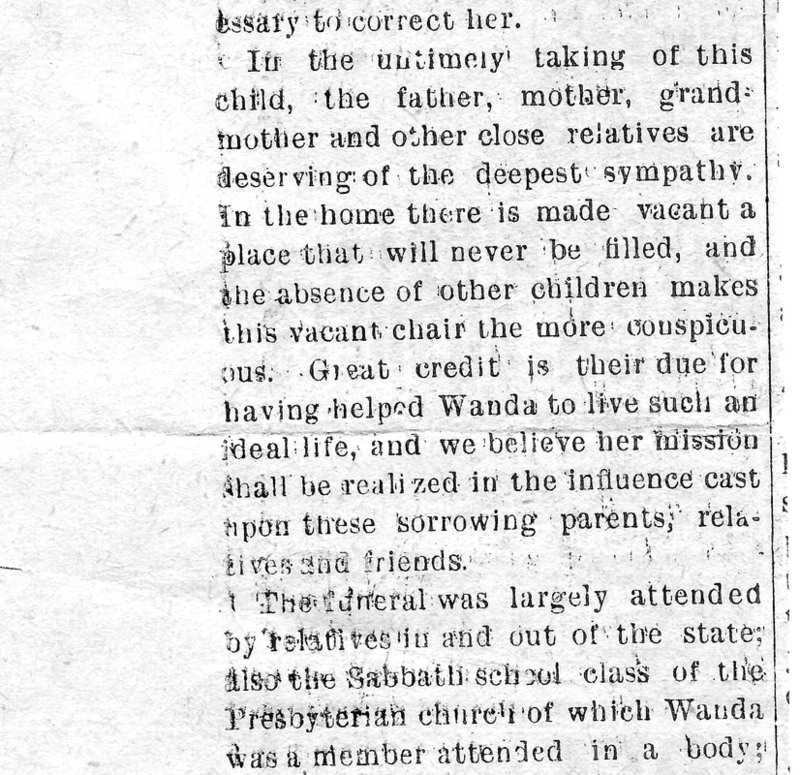 She leaves to mourn her passing, her husband, Howard; their daughter, Ardyce and son-in-law, Robert Freeman, and three grandsons: Russell, Roger, and Randy; four brothers, Lloyd Covault and wife Alice of table Rock, Richard Covault and wife Lottie of David City, Nebr., Wayne Covault, who had made his home with the Howellses for a number of years, Delmar Covault and his wife Jeannette of rural Pawnee City; a sister Lillian Bowen and husband, Johnny, Table Rock; brothers-in-law Clyde Howell and wife Flossie of Auburn and Raymond Howell of Costa Rica; an aunt, Mrs. Lucy Mertes of Pawnee City, and an aunt and uncle, Mr. and Mrs. C. W. Covault of Table Rock. A number of nieces, nephews and cousins and a host of friends are among those who will miss her greatly. TABLE ROCK- Wayne Herrick Covault, 82, Table Rock, died at Bryan Memorial Hospital in Lincoln on January 26, 1998. He was born at the family farm near Table Rock to John Alexander Covault and Lillian Bessie Herrick Covault on October 29, 1915. He graduated from Table Rock High School with the class of 1933. His chosen occupation was farming, which he enjoyed all his life. He gave devoted care to his parents, especially his dad, in later years. He was a member of the Table Rock Church of Christ for over 71 years, having been immersed into Christ in the Nemaha River. He served his church as a Deacon and Sunday School Superintendent. He was preceded in death by his parents; brothers, Lloyd, Delmar, and Richard; sister, Veda Howell. He is survived by a sister, Lillian. Daughter of John Alexander & Lillian Bessie (Herrick) Covault. She grew up, attended school and graduated at Table Rock in 1942. On Aug. 8, 1944 she was married to Lavelle Giles who was later killed in action during World War II in February of 1945. Lillian remarried June 9, 1949 to John Lester Bowen. They had four sons: Gregory John, Ricky Lee, Bradley Gene & Timothy Wayne. Lillian taught country school near Table Rock for several years. Her life was then devoted to raising their family. She was very active on the farm and involved in the community. school. She was involved in the Ladies Aid, Better Homemakers Extension Club and played the piano in various church functions. She helped John with the Quad County Pork Producers, Farm Bureau and local Republican Party activities. Lillian died at age eighty-six years, three months and twenty-one days. We do not yet have her obituary. 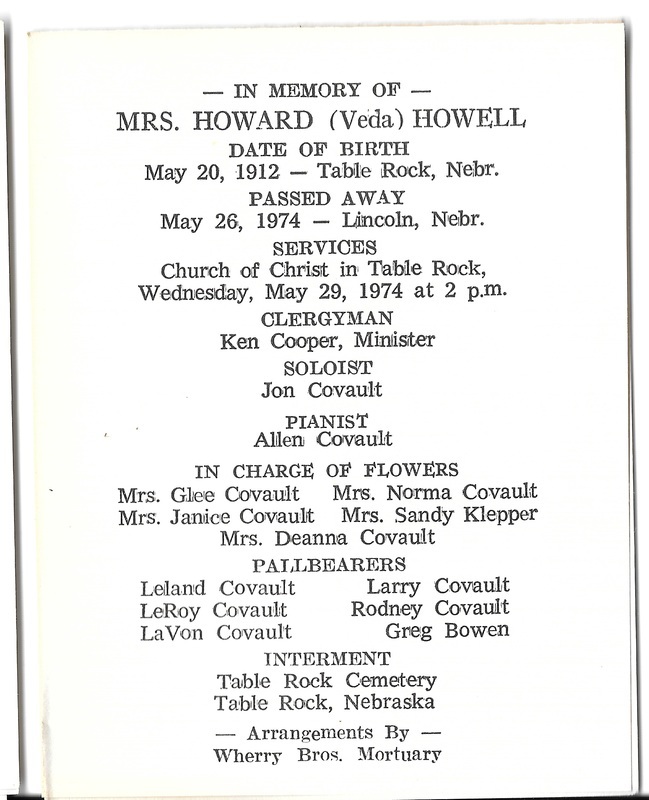 She married Edd Mertes, and they had a son, Leonard Mertes, who appears in the Sunday school class picture under the obituary of his uncle John A. Covault. Table Rock Argus, Mar. 5, 1970. A. J. Day, 81, of Yakima, Washington passed away March 3. He was the brother of Lewis Day. Graveside services will be held at the Table Rock cemetery. Anthony J. Day, better known as "Jum", was born July 9, 1888 near Humboldt, Nebr., the son of Silas and Mary Day, and passed away March 3, 1970 at Toppenish, Washington at the age of 81 years, 7 months and 24 days. He was preceded in death by his parents, an infant daughter, three sisters and three brothers. His childhood was spent in Richardson and Pawnee counties. In 1909 he was united in marriage to Lillie Buckles of Table Rock. To this union three children were born: Howard and Loraine, and an infant daughter. He leaves to mourn his passing his wife, sons Howard and Loraine, grandchildren and great=grandchildren, all of Washington; one brother, Jaffes Day, and sister Mrs. Jack Shirley, also of near Yakima, Wash.; sisters Mrs. Cora Spaulding of Dawson and Mrs. Frank James of Humboldt, and a brother, Lewis Day of Table Rock; nieces and nephews and other relatives and friends. Interment was in the table Rock Cemetery. Table Rock Argus, Apr. 1, 1971. GRAVESIDE SERVICES SATURDAY FOR MRS. A. J. DAY. Graveside services for Mrs. A. J. Day of Topenish, Washington, were held here Saturday morning at 11:00 with Larry Fiscus officiating. Mrs. Creely A, Day, wife of Anthony Day [not the Anthony Day born in 1888], died at her home, east of Table Rock, last night. She was a daughter of Silas Hays and had lived here most of her life. She was a victim of that dread disease consumption. Funeral services will be held at the home at 3 o'clock tomorrow afternoon, conducted by G. M. Gates, and the remains buried in Table Rock cemetery. She leaves a husband and two sons to mourn her loss. Bill Fellers and his brother Andrew were first-wave pioneers who settled east of Table Rock. William was a merchant. William and Susanna Fellers came to Nebraska and they had five children. After Susanna died in May 1892, William, later the same year, remarried. His new wife, Iantha, was a widow with a young daughter Martha (Flossie) DeArnold. Iantha, was a member of the Groves family of of Smithville, Missouri. Her widowed mother, Jane Johnston Groves, and sisters Louise Groves Duncan and Anna Mary Groves Fellers also ended up in Table Rock and are buried here. William Fellers died at his home in Lincoln on Monday night, after an illness of several weeks, following an operation for internal hernia which was performed on the 9th of December, and the remains were brought to Table Rock for burial on Tuesday afternoon. Mr. Fellers was one of the first settlers of this community, coming here in 1856, locating on a farm near what afterwards became the village of Table Rock; here he lived until he moved to town where he engaged in the mercantile business with his son Marion, later, another son, W. C. being associated with them, the father retiring from the firm. He was a successful farmer and stock raiser, and an excellent business man, and he accumulated a competence. He was born in Duchess county, New York, November 11, 1834. 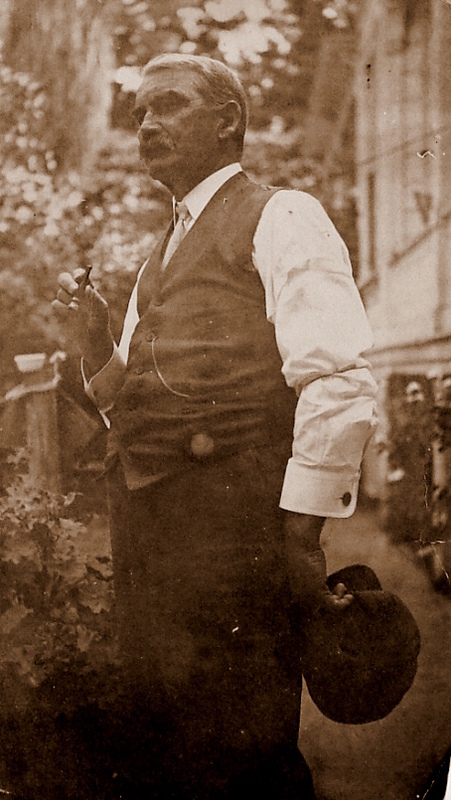 In 1855, he was united in marriage to Susana Freeman, to this union seven children were born: Osman W. Fellers, Table Rock; Marion N. Fellers and Anna M. Jones, Genessee, Idaho; Willis C. Fellers, Table Rock; Minnie Strickland, Keewane, Illinois; Mattie J. Smith, Kansas City; Lulu E. Fellers, deceased. His wife died May 8, 1893. On November 11, 1895, he was united in marriage to Mrs. Iantha J. DeArnold, and until March 1, 1905, they made there home in Table Rock; at that time they moved to Lincoln, where the family still resides. The body was brought to Table Rock Tuesday, accompanied by the widow, the daughter and her husband Mr. and Mrs. McKelvie, Dr. J. F. Kemper, Rev. George M. Gates and Rev. P.O. Johnson. The funeral services were held in the Methodist church, Dr. Kemper being in charge and addresses made by Dr. Kemper, Dr. Johnson and Rev. Gates, all former pastors of the deceased. The remains were buried in the Table Rock cemetery. 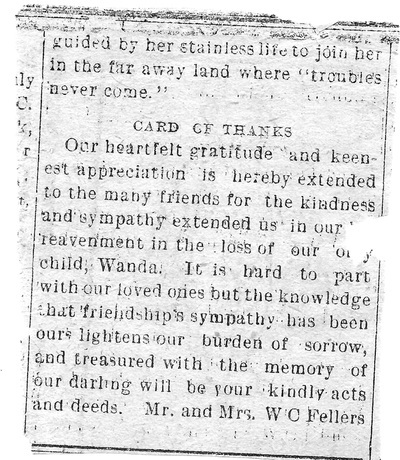 In the death of Mr. Fellers another of the early settlers of Table Rock has passed away; one whose rugged honesty won the friendship of all who knew him. He was always interested in the welfare of our town and contributed of his means in many ways to aid in its improvement, and his death causes grief to the entire community. We do not yet have obituaries for either Susanna or Iantha. Wanda Evangeline Fellers, only daughter of Mr. and Mrs. W. C. Fellers, was born in Table Rock, Nebraska April 24, 1892; died at her home in Table Rock, April 13, 1907. "By the bright waters now her lot is cast. Her heart is filled, her peace is won. The tidings of the passing of a relative or friend are most unwelcome, whether it be of one taken in the bloom of youth, or, in the later years of life. To be deprived of the happiness and love that come out of a close relationship with a true companion seems a blow almost too cruel to bear. In the death of our darling Wanda, this truth is brought home to each and every one who knew her. She was one blest of God. Not in the slightest action or word was she removed from the purity of nature that is cast about the new born babe; for she was a child, and it seems that God had chosen her as one to mingle with for the day, exemplifying the simplicity and those virtues that constitute the perfect life on earth. And by her untimely taking away a lesson is taught in the uncertainty of life. Wanda was a child who had every faith in her parents and was obedient to their least command. This was one of her sterling characters of nature which radiated from her daily actions, and in turn these loving parents placed about Wanda in her home and wherever she might be, every article and every influence that tended to the development of those characters of nature which are so much admired, but so commonly absent. From close acquaintance with this child (we call her a child because of her pure childish nature) we know her to be the embodiment of all that was good and kind in human nature. Upon the least parental reprimand for the little mistakes that are common among children, she would invariably return the sweetest of childish affections by means of a hug or a kiss to the one who had found it necessary to correct her. In the untimely taking of this child, the father, mother, grandmother and other relatives are deserving of the deepest sympathy. In the home there is made vacant a place that will never be filled, and the absence of other children makes this vacant chair the more conspicuous. Great credit is their due for having helped Wanda to live such an ideal life, and we believe her mission shall be realized in the influence cast upon these sorrowing parents, relatives and friends. 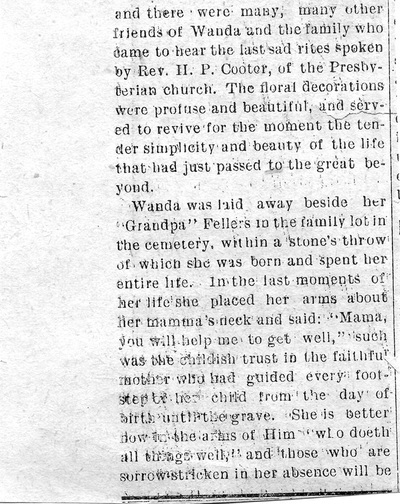 The funeral was largely attended by relatives in and out of the state; also the Sabbath school class of the Presbyterian church of which Wanda was a member attended in a body, and there were many, many other friends of Wanda and the family who came to hear the last rites spoken by Rev. H. P. Cooper, of the Presbyterian church. The floral decorations were profuse and beautiful, and served to revive for a moment the tender simplicity and beauty of the life that had just passed to the great beyond. 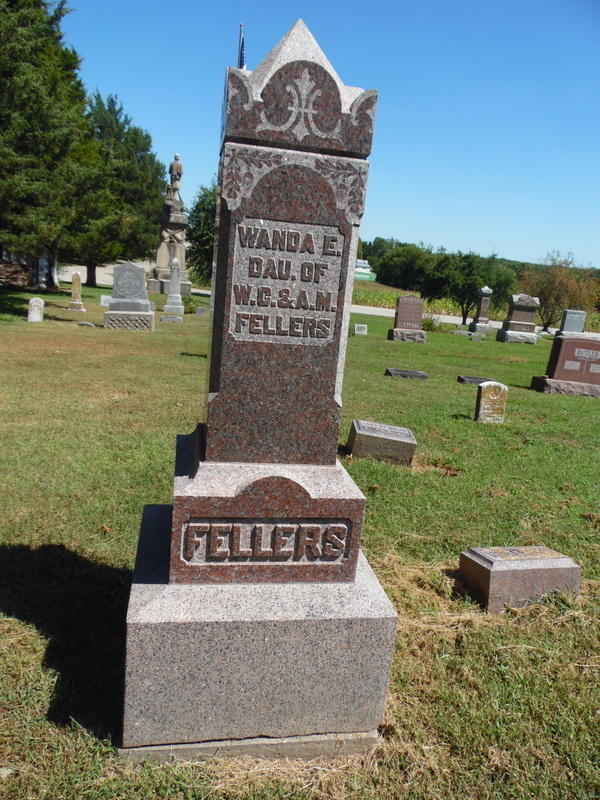 Wanda was laid to rest beside her "Grandpa" Fellers in the family lot in the cemetery within a stones throw of which she was born and spent her entire life. In the last moments of her life she placed her arms about her mamma's neck and said: "Mamma, you will help me to get well," such was the childish trust in the faithful mother, who had guided every footstep of her child from the day of birth until the grave. She is better now in the arms of Him "who doeth all things well. ", and those who are sorrow stricken in her absence will behold by her stainless life to join her in the far away land where "troubles never come." Table Rock Argus, Nov.18, 1965. John Findlay, 65, who had farmed in the area east of Table Rock for the past 30 years died Sunday morning in the Community Hospital in Falls City. He has been in failing health for the past sic months. Mr. Findlay was born and raised in the Stella area, before moving to the Table Rock area in 1932. Funeral services were held Tuesday afternoon at the Methodist Church in Table Rock with the Rev. Alvin Trucano officiating. Interment was in the Table Rock cemetery. 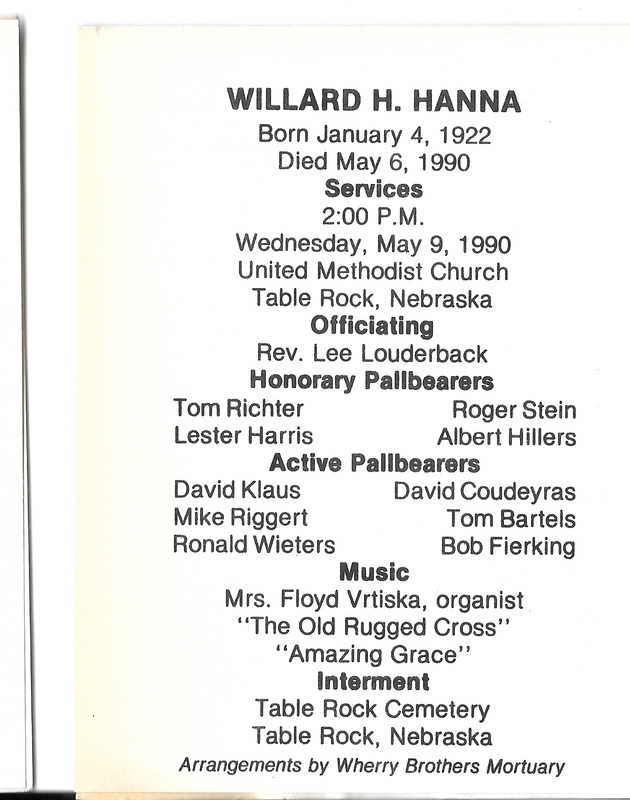 Pallbearers were Jim, Binder, R. W. Zelenka, Albert Miller, Frank Krofta, Willard Binder and Howard Whitney. John Findlay, son of John and Laura Gunnison Findlay, was born near Stella, Nebr. on August 23, 1900. He was one of five children. He received his education in the rural schools near Stella and grew to young manhood in this same community where he was born. On May 20, 1925, John was united in marriage to Edna Helen Branek. To this union five children were born, one daughter passing away in infancy. After their marriage Mr. and Mrs. Findlay made their home in the Stella community until 1932. 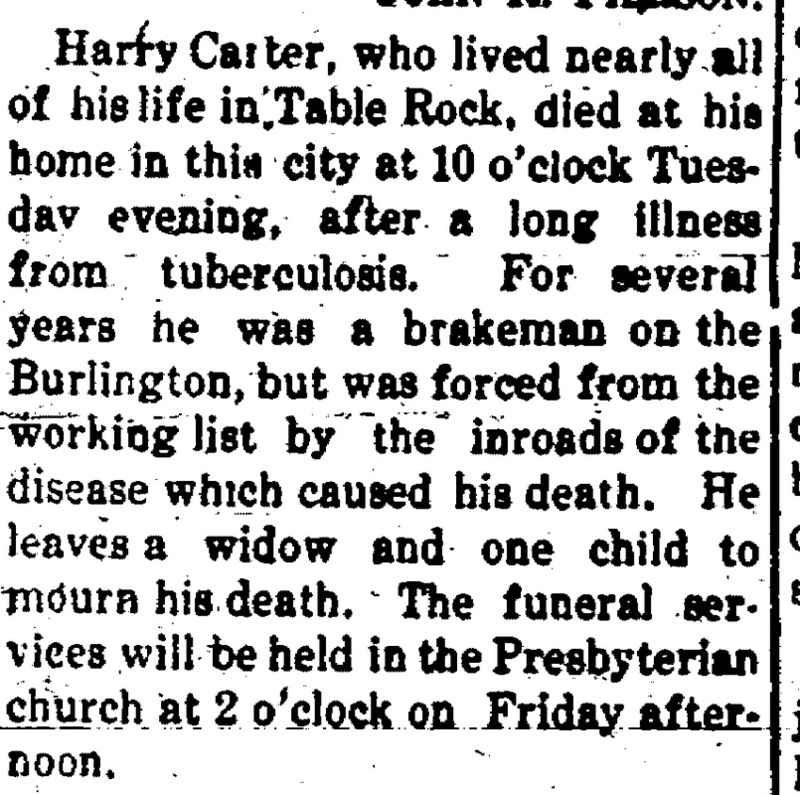 At this time they moved to Table Rock, where he was to live the remainder of his life. Mr. Findlay farmed all of his life and was always an active man until March of this year when his health began to fail. For the past few months his condition has been such that it was necessary for him to spend a good share of the time in the hospital. He passed away Sunday morning, November 14, 1965, at the Community Hospital in Falls City, having reached the age of 65 years, 2 months and 22 days. Besides his infant daughter, Mr. Findlay was preceded in death by his parents. Table Rock Argus, Mar. 4, 1965. Final rites were held Monday afternoon from the Methodist Church in Table Rock for Dr. A. P. Glider, who passed away at the Pawnee County Hospital on Friday, February 26, at the age of 75. He was born April 29, 1889 at Wellman, Iowa. Dr. Glider practiced as a chiropractor in Table Rock since 1937 and drew patients from a wide area. He began his practice in Pawnee City after graduating from a chiropractic school in 1923. He also had a part-time office in Falls City at one time. 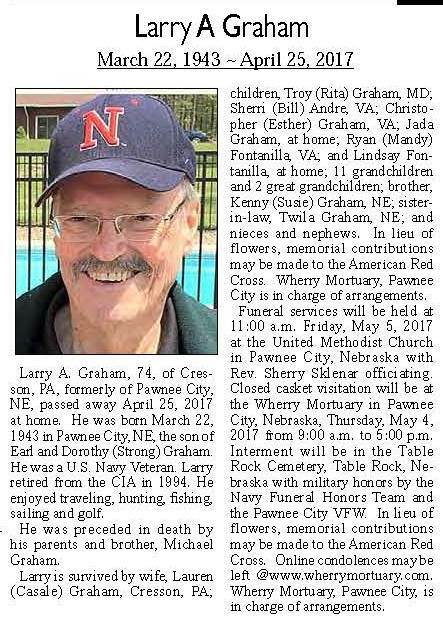 He was a representative of Assemblymen of the National Chiropractic Association, and a member of the American Legion Post in Table Rock. He is survived by a daughter, Mrs. Frank Pycha of Papillion, Nebr., and a brother, 85, who is in a rest home. He was preceded in death by two brothers, one sister, and his wife. Abram Greiner was born March 4, 1840, in Dyberry township, Wayne county, Penn. At the age of fifteen he was converted in a series of meetings held by Brother Kellog, and united with the Baptist church at Bethany, Wayne county. A short time afterward he transferred his membership to the Baptist church of Aldenville, Penn., of which he remained an acceptable member until he came to Nebraska, in 1867, when he united with the Baptist church at Pawnee City, by letter. He served the church as deacon fourteen years. In October, 1861, he enlisted in company H, 52nd regiment, Penn. volunteers, was promoted to corporal, then to sergeant, and in July 1865, was honorably discharged and mustered out. On December 7, 1865, he was united in marriage to Miss Lucy L. Parrish, near Aldenville, Penn. In the spring of 1867, he, with his wife came to Nebraska and settled upon a homestead in the Clear Creek neighborhood where he resided until the autumn of 1903, when he removed to Mineral Point, Kas., transferring his church membership to Waverly, Kas. He died at his home, Mineral Point, Kas., October 14, 1904. Of his father's family, only two members survive him, a brother and sister, Jackson Greiner and Mrs. Julia Pearce, both of Denver, Colo. Two brothers, one sister, and one half-sister having preceded him to the other shore. To Mr. and Mrs. Greiner were born two sons, William Joseph and Eugene Adelbert, who, with their mother, have suffered a loss the world can never make up, a loving husband and a kind father. The community has lost a sympathizing friend and neighbor, a good citizen and an honest man. 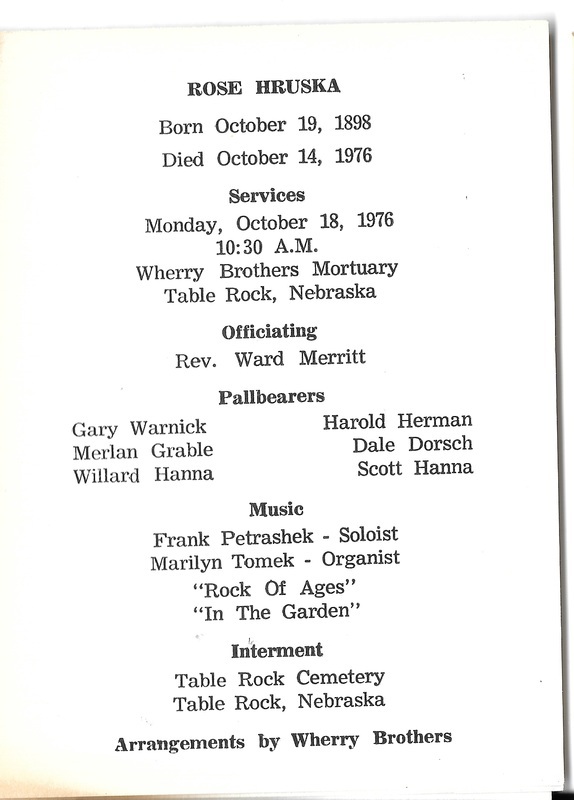 The remains were brought to Table Rock for interment, the funeral services being held on Sunday, October 16, at the M. E. church, conducted by A. H. Ballard, of York, Nebr., assisted by Revs. Tyler and Murphy of Table Rock. The John N. Gere Post, No. 289, and the Relief Corps each attended in a body, Mr. Greiner having been a member of the former. The ritual of the G.A.R. was observed at the grave. Mr. Ballard paid a tribute to the services of the deceased for his country in the Civil War and also to his work as a pioneer in Nebraska, in which state he did his share in the conquering of the wilderness and the building of homes and churches. The text was Psalms 90:12 to 18. Mrs. Greiner, together with her son, Eugene, and family, accompanied the remains from Kansas. 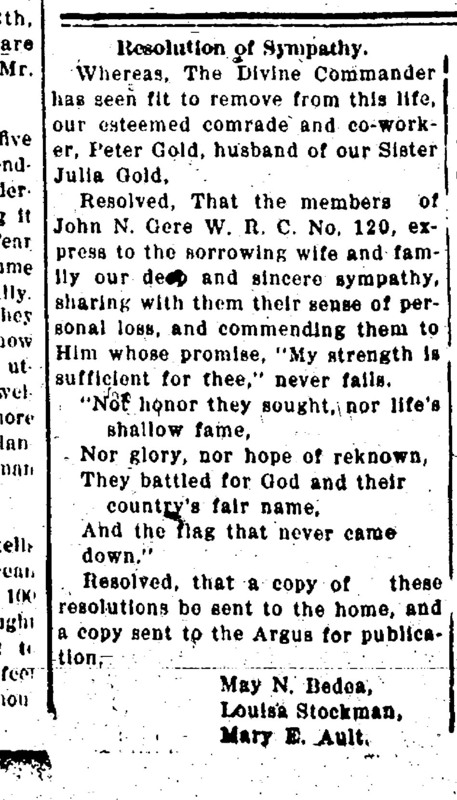 Others present at the funeral from abroad were Mr. Greiner's son William Greiner, of Washington, Kas., Jackson Greiner, brother of the deceased, and wife, of Denver, Colo. Mrs. Clift, sister of Mrs. Greiner, of Long Pine, Neb., Mr. and Mrs. Phillips of Tecumseh, George Clift, of Long Pine, and Mrs. Allie Loneke, of Humboldt. A delegation from John Ingain Post,of Pawnee City, attended the funeral in a body. The music was rendered by Miss Cummings, Mrs. Simon, and Messrs. Simon and Vasey, of the Pawnee Baptist choir. The pallbearers were T. J. Congdon and John Bruch of Pawnee, and C. H. Norris, James Fisher, C. R. Smith, and L. O. Snyder of Table Rock. Lucy Lovelee Parrish was born in Wayne County, Penn., May 1, 1845 and passed away at Huntley, Montana, December 29, 1936. On December 7, 1854 she was married to Abram Greiner of Aldenville, Penn. In March 1867 they moved to Nebraska and settled on a homestead near Table Rock where they made their home until 1903, when they moved to Kansas. After the death of her husband, she returned to Table Rock where she made her home until 1922, when she moved to Pratt, Kansas. In 1928 she moved to Huntley, Montana where she has since made her home with her sister, Mrs. C. A. Clift. Two sons were born to this union William J. and Eugene A., both having preceded her in death. She is survived by her two daughter-in-laws, five grandchildren and twelve great-grandchildren,one brother in California and one sister in Montana. She and her husband were charter members of the First Baptist Church in Pawnee City. 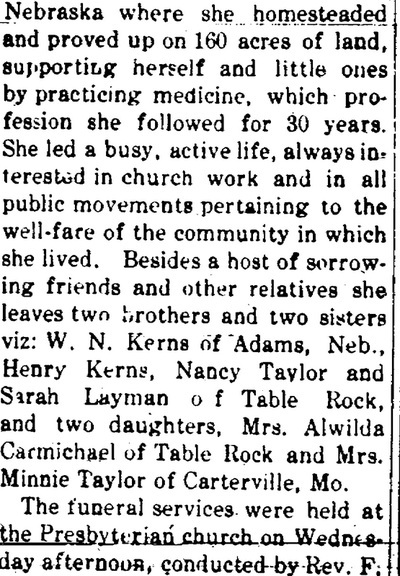 Later she transferred her membership to the Baptist church at Pratt, Kansas where she remained a member till her death. Funeral services were held at the Methodist church in Table Rock, Saturday morning, January 2, conducted by the pastor, Rev. Embree and the interment was in the family lot in the Table Rock cemetery. Out of town relatives who were present for the service were Mr. and Mrs. Roland Greiner of Winfield, Kansas, Mrs. Pearl Greiner and Mrs. Florence Greiner of Pratt, Kansas; Mrs. Cora Greiner, Crawford, Nebr. , Mrs. Verda Buman, Pawnee City and Mrs. C. A. Clift of Huntley, Montana. Mrs. Levenia Groom; wife of C. A. Groom, died at her home in this city on Saturday morning at 3 o'clock after an illness extending through many months. The funeral services were held in the M. E. church at 10 o'clock on Monday morning, under the auspices of the Women's Relief Corps, of which she was a member. Rev. W. M. Morrow preached the sermon and the remains were laid to rest in the Table Rock cemetery. Levenia Calvin was born in Champaign county, Ohio, May 15, 1838; she was united in marriage to Charles A. Groom, December 22, 1865; to this union six children were born: Edmond W., Mary A., C. Eugene, John E., Elma Pearl, and J. Ellsworth; four are dead, but the other two were at her bedside when she passed to the other world. In 1882 she came to Table Rock with her husband and family from Illinois, and this has been her home ever since. For many years she was a consistent member of the M. E. church and crossed death's river strong in the faith of a Risen Saviour. She was a devoted wife and mother, loved her home and family; she was kind to all, and won the esteem of all with whom she came in contact by her courteousness. A large circle of friends mourn her demise. To the bereaved husband and children the sincere sympathy of the community is extended. Ena Lois Davis, 93, of rural Table Rock, Nebraska was born on June 21, 1925 near Table Rock, Nebraska to Charles Edwin and Hilda Selma (Lionberger) Guzenhauser. She graduated from Humboldt High School with the class of 1943 then continued her education at the University of Nebraska in Lincoln. Ena passed away on Monday, November 19, 2018 at her home in rural Table Rock, Nebraska having reached the age of ninety-three years, four months, and twenty-nine days. She was preceded in death by her parents, husband David and son Matthew. Ena is survived by her son Charles Davis of rural Table Rock, Nebraska. A Private Interment was held at the Pioneer Dry Branch Cemetery in rural Humboldt on Tuesday, November 20, 2018.
grace WAS BORN IN SCOTLAND, LIVED IN ENGLAND, married lorens hanson in 1861, AND CAME TO TABLE ROCK IN 1880. lorens had been a seafaring man in his youth. 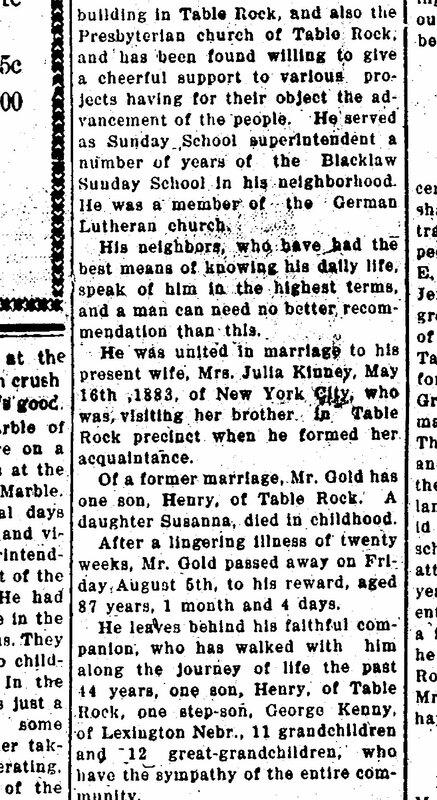 Their son James married Marie Stehlik; they had no children; he is buried in the Table Rock Cemetery but she left Table Rock after his death and is buried elsewhere. Their son John married Elma Bennington; they are buried in Mason City, Nebraska. Elma was one of a large Table Rock family of Francis & Florence Talbot Bennington; many of Elma's family members are buried in Table Rock, including her parents and her brother Ralph Bennington, who died in World War 1. Mr. Lawrence Hansen was born in Gottenburg, Sweden, October 27, 1836. His parents died during his early childhood and at the age of fourteen he went to sea. His life as a sailor led him to all well known ports of the world during the twenty years of sea life. He married Miss Grace McCully at North Shields, England, June 17, 1861. Two children were born to them, James A. and John A. He was a resident of Table Rock for quite a number of years. His wife died on June 17, 1910. For two or three years past he has lived with his son James, six miles north of town, where he died of cancer on Sunday, March 16th. For some time proceeding his death he had been a great sufferer. Mr. Hansen was the last of five brothers and sisters. He was baptized in the faith of the Swedish Lutheran church, and was recognized by those who knew him as an upright and industrious citizen, living a quiet and helpful life among his fellow men. The funeral service was held at the Methodist church on Tuesday, the eighteenth, with sermon by Rev. Howard P. Young. ​The interment took place at the Table Rock cemetery. TABLE ROCK ARGUS, June 23, 1910. Grace Marie McCauley was born in Edinburg, Scotland, October 5, 1838 and died in Table Rock, Nebraska, June 17, 1910, aged 71 years, 8 months and 13 days. She spent her early life in England where she united with the Established church, of which she has been a faithful member. In 1861, she married Lorens Hansen who with his two sons, James and John, survive her. They moved to Table Rock in 1880. Mrs. Hansen was a good woman and a good neighbor. She was careful in the work of her home and the care of her family. Unable to hear the sermons or music of the house of God, she remained at home and quietly worshiped the God whom she trusted. She was ready and willing to meet her Lord. She departed this life June 17, 1910 on the 40th anniversary of her wedding and the 30th anniversary of her removal to Table Rock. ​We miss thee from our home,dearest mother,We miss thee from thy place, A shadow o'er our life is cast,We miss thy kind and loving hand, Thy fond and loving care,Our home is dark without thee-We miss thee everywhere. (Provided on FindaGrave) James Adrian Hanson was born to Lawrence Lorens Hanson (1836 - 1913) and Grace M. McCully Hanson (1838 - 1910) in Tynemouth, Northumberland, England. He immigrated to the U. S. with his parents in 1882 settling in Nebraska. He married Marie (Mary) Stehlik in April 1909. They did not have children. After James died in Nebraska, Marie went to Missouri where her parents and other family were living. She died in Missouri and is buried in Greene Lawn Cemetery in Walnut Grove, Missouri, rather than in the grave next to James. TABLE ROCK ARGUS, May 7, 1942. James Hanson, 66, passed away Friday at the Humboldt Hospital. Funeral services were held at the Kovanda Chapel In Table Rock Sunday afternoon. He was laid to rest in the local cemetery. 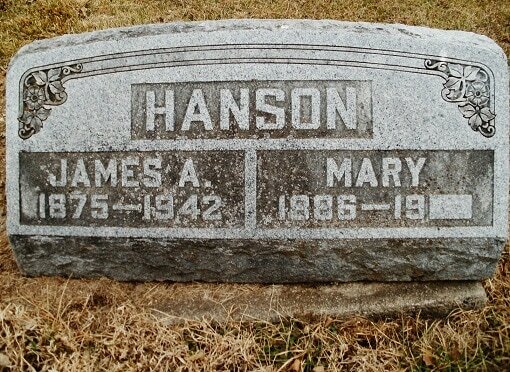 James Adrian Hanson, son of Lawrence and Grace Hanson was born in England, September 16, 1875 and came with his parents to Table Rock, Nebraska as a small child. In early youth he united with the Methodist Church. In April 1909, he was married to Miss Mary Stehlik, and settled on a farm seven miles north of Table Rock, where he lived until his death May 1st, 1942. Survivors are his wife Mary and only brother, John Albert Hanson of Hecla, Nebraska and cousins. THE TABLE ROCK ARGUS, Table Rock, Nebraska, Thursday, June 11, 1959, Page 3. 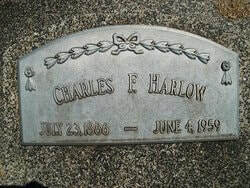 Charles F. Harlow was born on July 23, 1886, at Table Rock, Nebraska to Robert and Belle Harlow. He was the eldest of four children. He passed away June 4, 1959 at the age of 72. As a youth he lived on a farm near Bern, Kansas. After attending Peru Normal College, he returned to Bern and was employed in a hardware store until 1911. In that year he came to Table Rock, where he has lived the past 48 years. Mr. Harlow was the oldest local business man in point of years of service in Table Rock, where he operated an appliance and repair shop for many years. On October 18, 1912, he was united in marriage to Maggie Duryea and they were the first couple married in the new Pawnee county courthouse. Two girls and two boys were born to this union. He is survived by his wife and two daughters, Erma Hinds of Papillion, Nebr., and Doris Palazzo of Kansas City, Mo. ; and two sons, Charles of Greenfield, Indiana and Lealan of Lincoln, Nebr. Six grandchildren, a brother, Earl of Baltimore and two sisters, Nellie Harlow of Detroit, Mich. and Cecil Bowles of Portland, Oregon also survive. 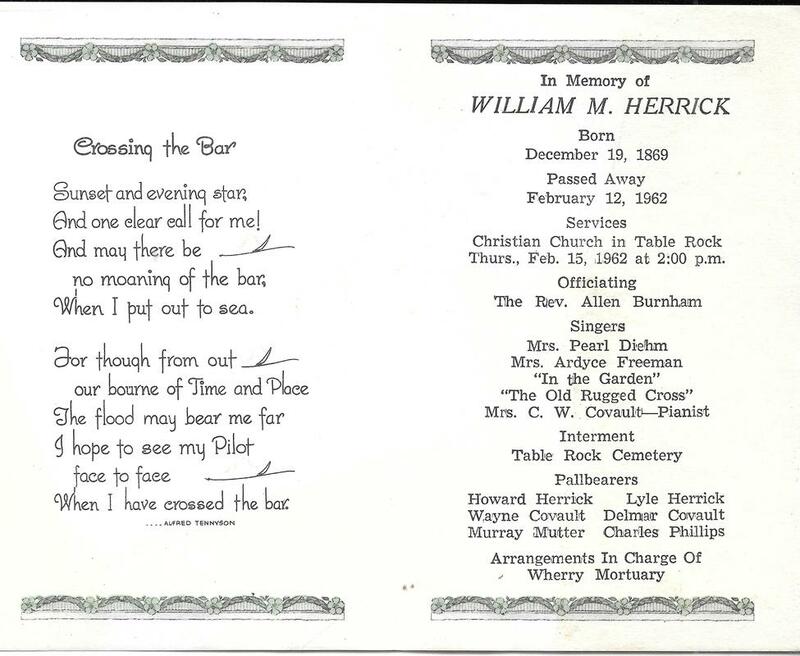 Funeral services were held on Sunday afternoon at the Wherry Mortuary of Table Rock with the Rev. George Danskin and Rev. A. L. Embree of Plattsmouth, officiating. Duet numbers were sung by Marilyn Wright and Kathy Deubelbeiss, with Mrs. Wayne Diehm at the piano. Burial was made in the Table Rock cemetery. Active pallbearers were Marvin Kent, Arthur Meier, Wayne Diehm, Norris Gold, Robert Stillinger, Charles Binder,Jr. Honorary pallbearers included Edgar Norris, Paul Diehm, Amos Fritch, Will Alderman, Victor Fellers, William Vondrasek, C. J. Binder,Sr. and A. N. Ayler,Sr. Civil War veteran John Whippletree Hastings and his wie Martha Grieve Hastins had ten children, with William Blaine being about the middle. The children were Nora, Ezrom, Warren, William, Eva, Emery, George, Frank, Elmira, and Charles, born between about 1870 and 1892. PVT, Co. F, 24th Iowa Infantry, Civil War. (Table Rock Argus, May 8, 1941). John W. Hastings Passes Away. John W. Hastings was born in Richland County, Ohio, February 16, 1840, and passed away at his home, four and one-half miles northeast of Table Rock, May 2, 1914 at the age of 74 years, two months and 16 days. While not way strong, he seemed as well as usual, Saturday morning and was helping with the chores, but when he did not respond to a call to breakfast, his son Emory hurried out, and found him lying unconscious in the yard. He lived only a few minutes after the arrival of the doctor, who was called immediately. On December 24, 1868, Mr. Hastings was married to Miss Martha M. Grieve, at Tipton, Cedar County, Iowa, and to this union ten children were born. Three of these were called home before their father's summons came, Elmira C., Charles H. and George H.
The remaining children are, Mrs. Nora M. Marquett, Albia, Iowa, Esrom W., Portis, Osborn Co., Kansas, Eva J. Dalkey, Humboldt, and Warren H., William B., Emery H. and Frank E. of Table Rock, all of whom gathered at home as soon as possible to comfort their sorrowing mother, who has been very sick for two weeks. John W. Hastings served his country faithfully as a soldier, enlisting in Company F, 24, Regiment Volunteer Infantry, at Lisbon, Iowa, August 8, 1862 and was honorably discharged after serving two years and six months. At the time of his death he was officer of the day in John N. Gere Post No. 165 Table Rock Department of Nebraska and he had at various times filled other important offices, being one year junior vice, one year senior vice, and two years commander of the post. Since coming to Pawnee County in 1891, Mr. Hastings, has made many friends, and will be greatly missed in the home and the community. The relatives who came a distance to attend the funeral services besides the children are Mr. Warren Hastings, Gillman, Ill., brother; Mrs. Samuel Hastings, Jesse Hastings, Mrs. Lizzie Bramburg, all of Kansas City, Kan., sister-in-law, nephew, and niece; Mr. George Grieve and John Grieve of Portis, Kan., brother-in-law, and nephew; Mrs. Emma Millage, Alva, Ok., niece; and Mr. James Barclay, Humboldt, Neb. nephew. The funeral service was held at the family residence, Rev. Wimberly had charge of the services. The old soldiers were pall bearers. Martha M. Grieve was born at Fine, New York, September 16, 1850, and died at the home of her son, Frank E. Hastings, 1640 So. 24th St., Lincoln, Nebraska, at the age of 79 years, 11 months and 19 days. 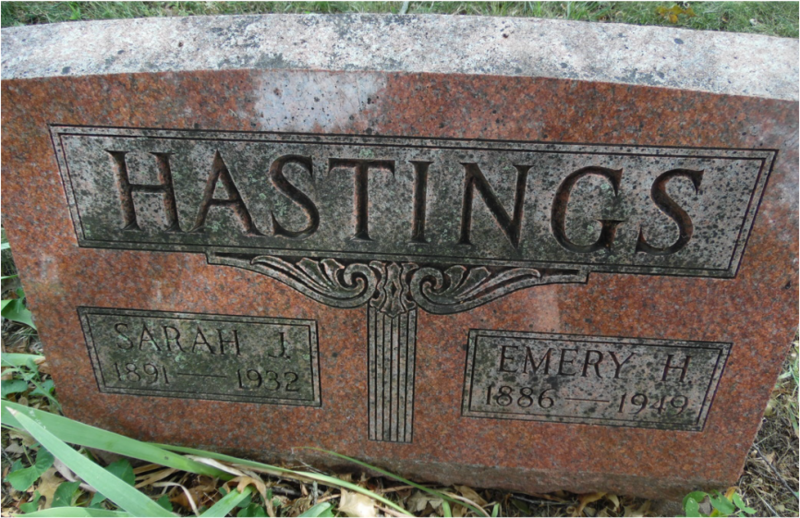 She was married to John W. Hastings December 24, 1868, at Tipton, Cedar Co., Iowa. To this union were born ten children, of which six survive their mother, and all of whom were at her bedside when she passed to the great beyond. She leaves to mourn their loss five sons and one daughter, Ezrom W. Hastings of Humboldt, Nebr. ; William B. Hastings of Table Rock; Emery H. of Cook, Nebr. ; Frank E. of Lincoln, Nebr. 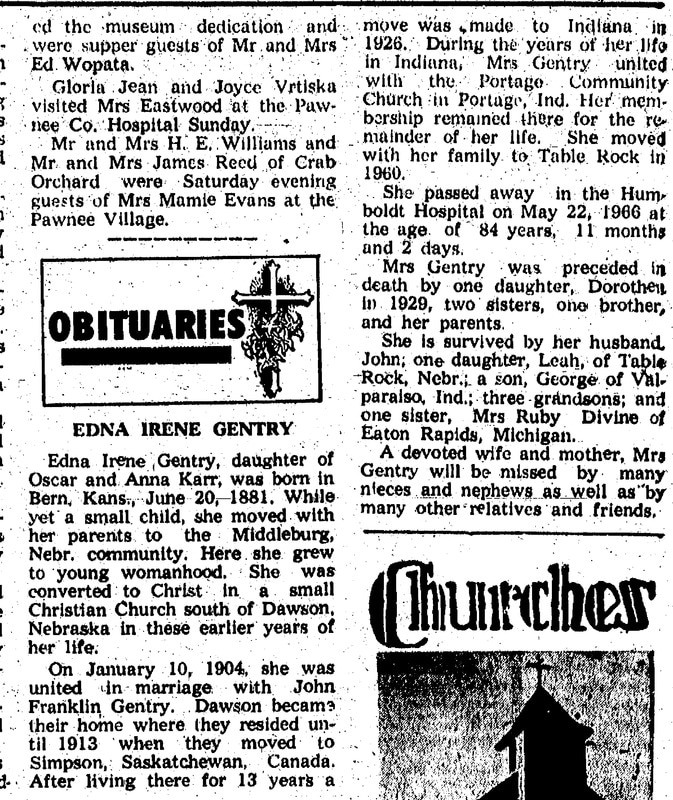 ; and Mrs. Eva Dahlke of Humboldt, Nebr. ; beside two brothers, John Grieve of Cameron, Missouri, and James Grieve of San Antonia, Texas, 19 grandchildren, 13 great-grandchildren and a host of friends. She was a faithful mother, a kind and loving neighbor and will be greatly missed by all who knew her. The remains were brought to Table Rock for burial. Funeral services were held in the Methodist Episcopal church Sunday afternoon, conducted by Rev. A. L. Ogden, and interment was made beside the grave of her husband in the Table Rock cemetery. I almost gave up on this one, but found that the STONE DATE FOR THE YEAR OF DEATH IS WRONG. It is 1956. I also found the "William W. Hastings" that is listed is actually John W. Hastings. NOTE:THE YEAR ON HIS STONE IS WRONG, HE DIED IN 1956. He was born March 2, 1881 and died December 29, 1956. TABLE ROCK ARGUS, Thur. Jan. 3, 1957. Funeral services were held on Monday afternoon for William Hastings, former Table Rock resident, who died at the Pawnee County Hospital Saturday evening. He was 76 years of age. Final rites were held at the Wherry Bros. Chapel in Table Rock with Ward Merritt of Humboldt in charge. Burial was made in the Table Rock cemetery. Surviving him are one son, Bill, and three daughters, Mrs. Vaunda Vincent, Mrs. Betty Holster, and Mrs. Verna Chesnut, all of Ft. Worth, Texas. Sarah's obituary has not yet been located. Helen's obituary has not yet been located. ​Emery was the son of John W. and Martha Matilda (Grieve) Hastings. Emery married Sarah Jane Morris and had three children, Harold, Charles, and Leo. He then married Helen Bloss/Haltgren and they had a son, Keith. FUNERAL HELD FOR EMERY HASTINGS. FORMER RESIDENT IS LAID TO REST HERE; DIED AT SALINA, KANS. Funeral services were held on Wednesday afternoon for Emery H. Hastings, 62, who passed away February 20th at Salina, Kansas. Last rites were held in the Kovanda Chapel in Table Rock. Rev. Ward Merritt of Humboldt was in charge. Burial was made in the Table Rock cemetery. Mr. and Mrs. Hastings and family resided on a farm north of Table Rock until 1929 when they moved to Cook, and then to Tecumseh before permanently settling in Lincoln. Emery H. Hastings was born April 27, 1886 on a farm near Blue Springs, Nebr. to John W. and Martha M. Hastings. In August, 1914, he was united in marriage to Sarah Morris and to this union three sons were born, Harold M., Charles E. and Leo Dale. His wife, and son Leo preceded him in death. In 1937, he was married to Helen B. Haltgren and to this union one son, Keith was born. Mr. Hastings was a member of the Christian Church of Table Rock for several years before moving to Lincoln. He passed away February 20th at 12:40 p.m. at the Salina Nursing home, Salina, Kansas. 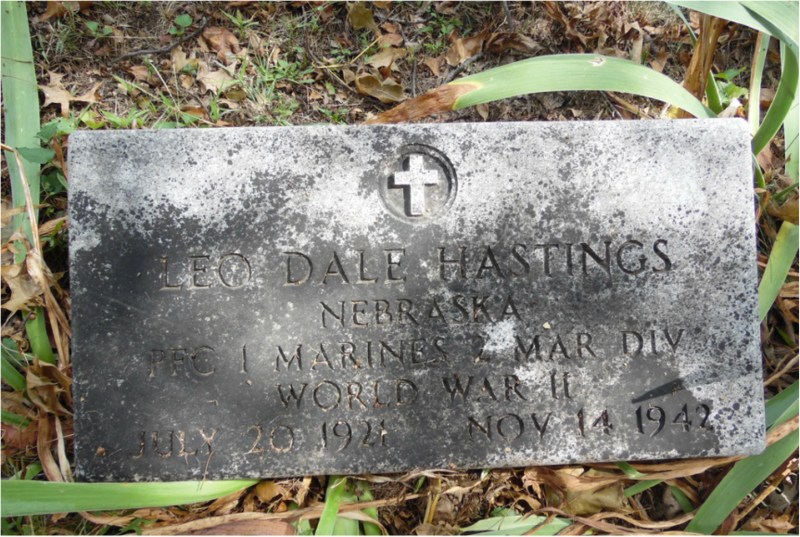 Besides his sons, he leaves to mourn 3 brothers: William Hastings of Table Rock, Warren Hastings of Pawnee City, and F. E. Hastings of Lexington, Nebr. and son sister, Eva Dahlke of Tecumseh. Also mourning his loss are two grandchildren, Richard Hastings of Lewiston, Idaho and Charles Hastings of Chicago, Ill. Two brothers and one sister preceded him in death. TABLE ROCK ARGUS,Dec. 17, 1942. Emery Hastings of Lincoln, Nebraska, former resident of Table Rock, received a telegram Sunday morning from the Marines Headquarters at Arlington, Virginia, advising him that his son, Leo, 21, had been killed in action. Leo enlisted in the Marines soon after war was declared, along with his brother, Charles. They left for overseas duty on July 1, and were together at all times. Leo's death occurred on Guadalcanal Island in the Solomon Islands group, fighting the Japanese. Leo was born near Table Rock, and attended high school here. He was also a former football player at Bethany high school at Lincoln. Besides his parents, Mr. and Mrs. Emery Hastings, his is survived by three brothers, Charles, Harold, of Spokane, Wash., and Keith at home. No obituary has been found. Mr. Hastings reportedly died in 2012; his remains were forwarded by a funeral home to the Table Rock Cemetery Association in Autumn 2015. At the burial, military honors were rendered by the Table Rock American Legion, Brown-Hayes Post 289; Mr. Hastings was a lifetime member. The Post secured a military tombstone but it has not yet been photographed. No obituary has been found. Limited information has been located. Lucille was the daughter of Wiley & Aoa Ama (Brown) Gossett. On January 10, 1976, she married Keith Hastings at Hastings, NE. The couple lived in Texas and Kansas before moving back to Nebraska. She was the mother of Leon, Glenn, Joe & Charlene. Robert Lynn Hays, 93, passed away Tuesday afternoon at his home in Humboldt, after having been in failing health for over a year and bedfast for the past seven weeks. Funeral services were held at 2 o'clock Thursday afternoon at the Kovanda-Beethe Funeral Home in Table Rock. Final rites were in charge of Rev. Ward Merritt of Humboldt and burial was made in the Table Rock cemetery. One of twins in a family of thirteen children, Mr. Hays was born at Princeton, Illinois, September 16, 1857. He was united in marriage to Martha Pierce at Ness City, Ks. and to this union were born six children, three sons and three daughters. One son gave his life for his country, and died in France during World War II. He had always lived on a farm until eight years ago when he retired and established his home in Humboldt. Mr. and Mrs. Hays celebrated their 63rd wedding anniversary March 31, 1950. He is survived by his widow, two sons and three daughters: Ralph of Humboldt, Jay of Billings, Montana, Ida Snoke, Golda Clement and Beulah Hendrix of Humboldt; two brothers and two sisters: Joe of Table Rock, Tom of Joplin, Mo., Jennie Davis of Humboldt and Maude Heer, Table Rock; also 14 grandchildren and 8 great-grandchildren. Marion Bonham and Raymond Giles sang, "Sweet Bye and Bye", "Home of the Soul", and "Sweet Hour of Prayer." The piano accompaniment was played by Mrs. Jean Goldsberry. Pallbearers were Frank Reuter, Vernon Sandusky, Charles Hanna, Edgar Gilbert, Jay Dow and Glenn Kent. Funeral services were held at the Asa chapel in Humboldt on Monday morning for Mrs. Martha Ann Hays, 93, who passed away Friday, June 10th at the Holman Hospital in Humboldt. The services were conducted by the Rev. 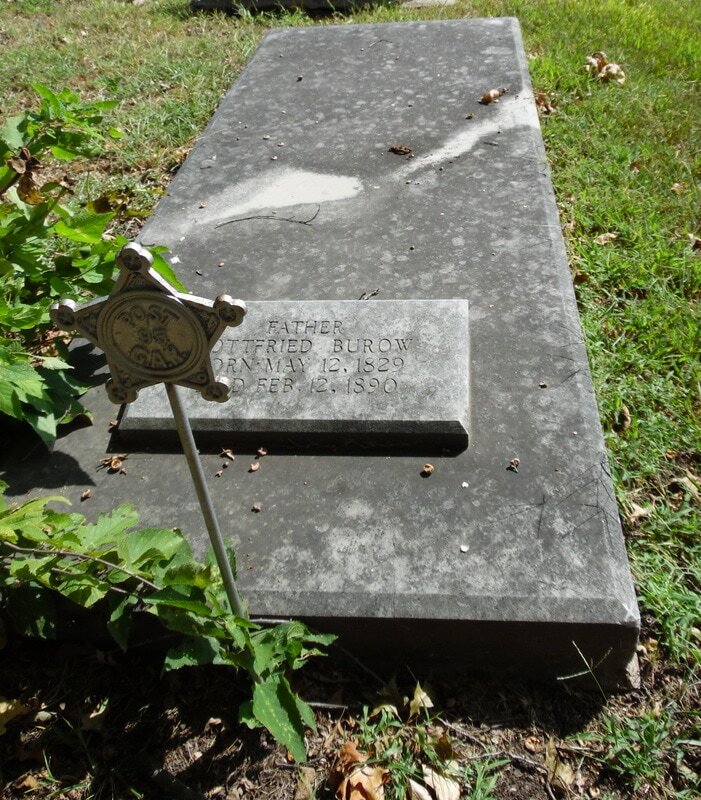 Ward Merritt and burial was made in the Table Rock cemetery. Survivors include two sons, Ralph Hays of Humboldt and John Hays of Roberts, Montana; three daughters, Mrs. Ida Snoke, Mrs. Beulah Hendrix and Mrs. Golda Clement all of Humboldt; 15 grandchildren and 28 great-grandchildren also survive. Jay D. Hays, 72, formerly of Humboldt area, passed away at the Veteran's Hospital in Miles City, Montana, Friday, September 29, 1961. Funeral services were held at the Wherry Mortuary in Table Rock Wednesday afternoon with the Rev. Ward Merritt of Humboldt officiating. Burial was made in the Table Rock cemetery. samuel and angeline (bugbee) hitt. ​her date of death was never inscribed. it's 1932. Table Rock Argus, Feb. 20, 1913. Samuel Hitt was born in 1845 in Kirtland, Ohio. He died on Sunday morning, February 16th at about 6 o'clock at his residence in Table Rock. His mother died when he ws but sixteen months old, and when he was quite young he removed with his father to Illinois, where he grew to manhood. In 1863 he was united in marriage to Angeline Bugber. To them were born three children: Mrs. Isner, Plattsmouth, Nebr., F. L. Hitt, of Norfolk, Nebr., and Charles Hitt, of Plattsmouth, Nebr. He had one sister, Mrs. Jane Brooks of Omaha, and two brothers, L. M. and William Hitt, of Elwood, Kansas. The children and sister were present at the funeral services. Mr. Hitt was baptized in the Methodist faith when a small child. He became a member of the Methodist church of Table Rock about three years ago, having brought his membership here from the western part of the state. In his illness which continued nearly a year he manifested his faith in divine things by christian fortitude and patience and died in the firm hope of the life beyond. a large number of friends and neighbors gathered at the home on Monday afternoon, the 17th where at 3 o'clock the funeral services were held. Rev. Howard P. young, pastor of the Methodist church, made a short address based on the first part of 14th chapter of John and Rev. c. P. W. Wimberly, pastor of the Presbyterian church gave brief remarks. The burial took place at the Table Rock cemetery. 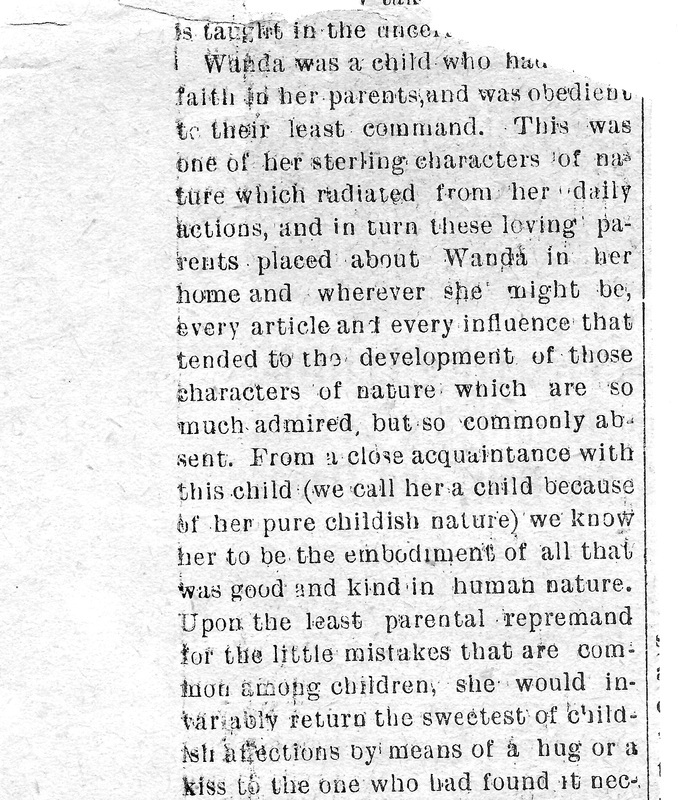 Omaha Daily Bee, Feb. 18, 1913 pg.2. Death Record. S. W. Hitt, who lived in the west part of town, died Sunday morning after a lingering illness of nearly a year of cancer of the liver. He leaves an aged wife and a son at Norfolk Nebr., and a son and daughter at Plattsmouth, Nebr. He had passed his three-score years and ten. Funeral services will be held Tuesday forenoon. NOTE: STONE HAS BIRTH YEAR 1844, OBITUARY 1845. Mrs.Anna Hitt, an old resident of Table Rock passed away about 3 o'clock Tuesday morning. She had been living alone and early last week neighbors found her ill in her rooms. She was given every attention possible and her relatives at Plattsmouth were notified of her condition and came down to take care of her but she passed away at the time stated above. Funeral services were held Wednesday afternoon in the Methodist church, conducted by the pastor, Rev. W. E. Caldwell. Angeline Bugbee was born in Ohio July 25, 1847, and passed away in Table Rock, February 2, 1932, at the age of 85 years, 6 months and 2 days. Later she moved with her parents to Iona, Illinois where she was married to Samuel Hitt, February 23, 1864. To this union were born three children: Mary Isner, Spokane, Wash.; Frank, Sioux City, Iowa, and Charles E. Hitt, who with the husband and father preceded her in death. Besides the son and daughter, there are two brothers, Fred Bugbee, Omaha, and C. F. Bugbee, of Oklahoma; several grandchildren and a host of friends. From Illinois they moved to Iowa, and from there to Beaver City and from thereto Table Rock. At an early age she joined the Methodist church and was a devoted member until her death. She was also a member of the Relief Corps. It shall be light at evening time. At evening time it shall be light." Table Rock Argus, Feb. 15, 1962. Funeral services were held this Thursday afternoon for William M. Herrick, who passed away at the Pawnee County Memorial Hospital on Monday, where he had been a patient for the past few weeks. Final rites were held from the Christian church in Table Rock with the Rev. Allen Burnham officiating. Mr. Herrick had been a resident of Table Rock since 1922, following retirement from the farm northwest of town. He died at the age of 92, the oldest resident of this community. Pallbearers were Howard Herrick, Lyle Herrick, Wayne Covault, Delmar Covault, Murray Mutter, and Charles Phillips. 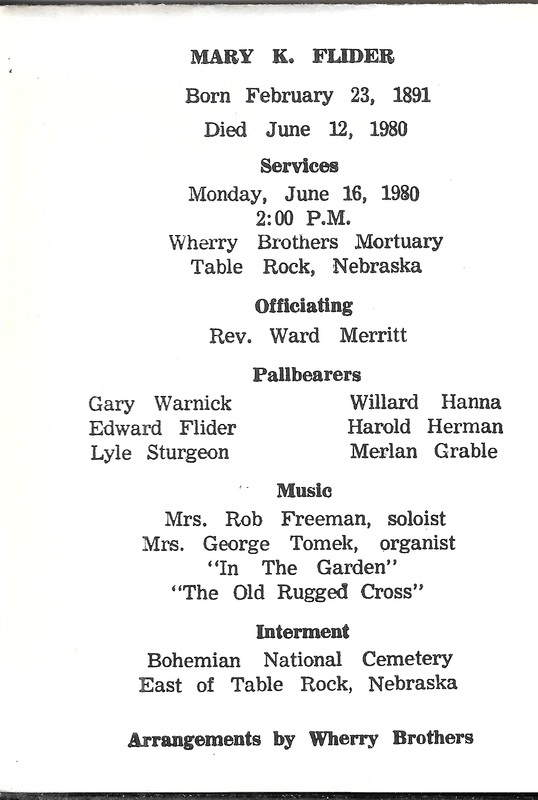 Singers at the services were Mrs. Pearl Diehm and Mrs. Robert Freeman, with Mrs. C. W. Covault as pianist. Interment was made in the Table Rock cemetery. William Murray Herrick, son of William D. and Mary West Herrick, was born in Woodford county, Illinois, December 19, 1869. He departed this from this life at the Pawnee County Memorial Hospital February 12, 1962, at the age of 92 years. When two years old, he and his parents and older sister, Minnie, moved to Nebraska. They settled on a farm in the Clear Creek community. There he grew to manhood. He received his education in the rural school of that community. On April 11, 1894 he was married to Mary E. Jones. They established their home on a farm northwest of Table Rock, where they remained fro 28 years. Upon retirement they moved to their home in Table Rock, where they lived together to celebrate their 64th wedding anniversary. He was a member of the Masonic Lodge No. 108 of Table Rock since 1922. In his early youth he became a member of the Christian church. He was preceded in death by his parents, his wife, Mary; two sisters, Bessie Covault and Minnie Asher; two brothers, Walter and John. He leaves to mourn three daughters, Edna Woods, LaMesa, Calif.; Mildred Mehlin of Table Rock; and Bernice Wadlow of Wilmington, Calif.; one sister, Lola Phillips of Table Rock; two grandchildren, Dale Woods and Mary Alice Winchell, LaMesa, Calif.; and five great-grandchildren. The tombstone is tilting badly, as reflected by this picture. Benjamin Horton - not obituary has yet been found. TABLE ROCK ARGUS, Aug. 16, 1918. 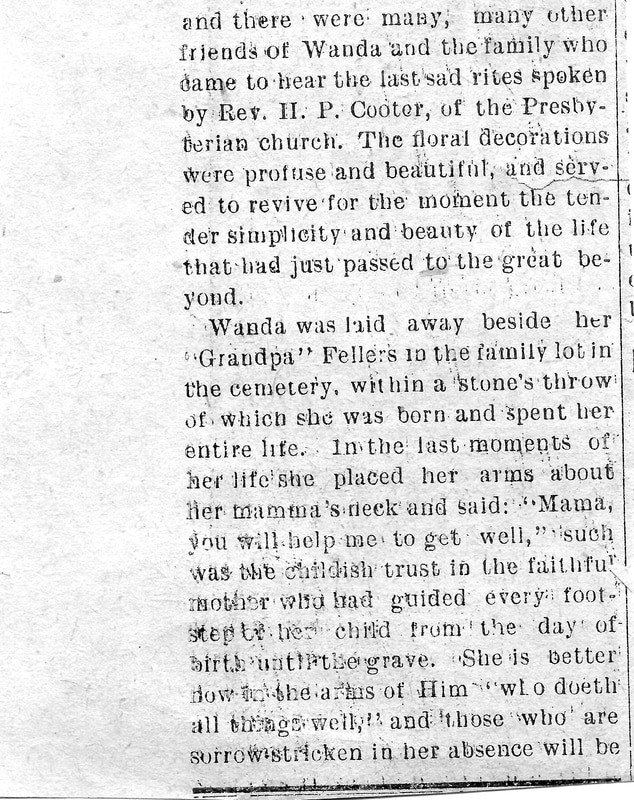 OBITUARY- Cornelia Augusta Wambels was born April 30, 1862, at Stillwater, Livingston county, New York. Moved with her parents to Wisconsin at the age of four years. After living there nine years, she moved to Nebraska. On March 21, 1868, she was married to Benjamin Horton, at Pawnee City. 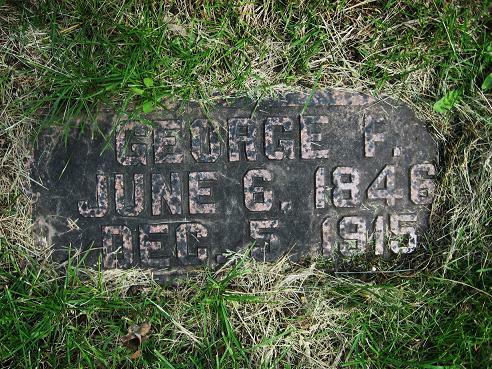 To this union were born eleven children: George W., Daisy M. and William dying in infancy. The surviving children are: Mrs. Hattie Martin, Williard, Kansas; Elvey A., Robstown, Texas; Ludell E. and Fred G., Roswell, N.M.; Sidney B., Arthur G., Mrs. Nelle M. Alderman, and Mrs. Grace Bowen, Table Rock, Nebr. ; also left ten grandchildren and one great-grandchild. Mr. and Mrs. Horton started their married life on a farm four and a half miles from Pawnee City. After living in Pawnee county five years, they moved to the farm three miles north of Table Rock, where she was bereft of her husband, April 10, 1891. She continued to reside on the farm until her death, which occurred on Monday, August 12, 1918, at 10:28 a.m., at the age of 66 years, 3 months and 12 days. At the age of fifteen she united with the Christian church and remained faithful to the end. Her Christian graces were of the type that the more intimately she was known the more she was appreciated. Her kind disposition, sympathy and unswerving honesty endeared her to all who knew her. Her welcome greeting to neighbors and friends will long be remembered by those who were fortunate enough to be numbered among her acquaintances.The unselfish spirit that characterized her entire life was displayed throughout her final illness, her earnest desire being to shield her loved ones as much as possible from the responsibility of her care. She endured the hardships of pioneer days with strength and fortitude and lived to see our state transferred from the Indians hunting grounds to the beautiful land of today. It was indeed a pleasure to know Mrs. Horton and in her passing a member of one of the earliest and best known families of our community has passed to the Great Beyond. Her children have lost a devoted mother, the neighborhood a valued neighbor and the many that knew her a sincere friend. To the bereaved ones the sympathy of their many friends is given in unstinted degree. Funeral services were held in the Christian church at 8 o'clock Wednesday night, conducted by Elder F. E. Blanchard, of Tecumseh. There is no known obituary for this little boy. The inscription says he died at the age of five years, one month, and 19 days. TABLE ROCK ARGUS, Nov. 2, 1950. DEATH COMES TO SID HORTON, 74. LONG-TIME TABLE ROCK RESIDENT SUCCUMBS ON OCTOBER 30, WAS 74 YEARS OLD. Funeral services were held on Wednesday afternoon for Sid B. Horton, who passed away at the Pawnee Hospital early Monday morning, after an illness of several weeks. Last rites were held at the Kovanda Chapel in Table Rock with the Rev. Ward Merritt of Humboldt in charge of services. Interment was made in the Table Rock cemetery. Sidney Benjamin Horton, fifth child of Benjamin and Augusta Horton, was born in Humboldt, Nebraska, June 4th, 1876, and passed away at the Pawnee City Hospital Monday, October 30th, 1950 at the age of 74 years, 4 months and 26 days. The family having moved to a farm north of Table Rock when he was a child. Sidney spent most of his life in Pawnee county. In 1915 he married Lottie Bush. To this union one son, Marvin B. was born. For a number of years, Sid has been in poor health. The 8th of August he entered the Pawnee City Hospital. Although he suffered much, the nurses spoke of him as being a very good patient. Sid was a kind and loving husband and father, and a good neighbor. Two brothers, George and William, two sisters, Hattie and Daisy, having preceded him in death, he leaves to mourn his wife, Lottie; son Marvin and wife Ruby of Denver, Colo.; three grandchildren; four brothers, Al of Robstown, Texas, Lew and Fred of Roswell, N. Mex. and Arthur of Table Rock; two sisters, Mrs. Myrtle Alderman of Table Rock and Mrs. Grace Bowen of Lincoln; a number of nieces and nephews, and other relatives and a host of friends. TABLE ROCK ARGUS, Oct. 14, 1954. FINAL RITES HELD FOR MRS. LOTTIE HORTON ON WEDNESDAY AT CHAPEL. This community lost another of its elder residents Monday noon in the death of Mrs. Lottie Jane Horton, 78, who passed away at a Pawnee City Nursing Home. She had been in ill health since she fractured her hip in a fall about a year and a half ago. Funeral services were held on Wednesday afternoon at the Kovanda-Beethe Chapel in Table Rock with Rev. 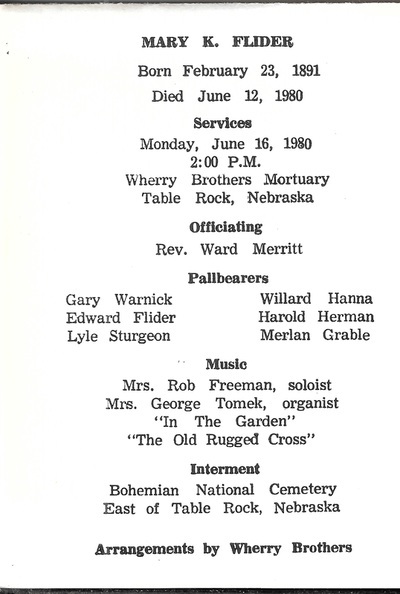 Ward Merritt of Humboldt officiating.A vocal duet was rendered by Mr. and Mrs. C. Bonham with Mrs. Wayne Diehm at the piano.Burial was made in the Table Rock cemetery, beside the body of her husband, Sid Horton, who passed away in 1950. Pallbearers included Edwin Fritch, Ed Tomek, Joe Tomek,Jr., Philip Rabstejnek, Rudolph Karas and Rudolph Zelenka. Mrs. Edwin Fritch had charge of flowers..
Lottie Jane Bush was born to Rebecca Neptune and John Bush August 28. 1876 on a farm in Richardson county, Nebraska. She attended school in the Bush School. Most of her life was spent in this community. She was united in marriage to Sidney B. Horton. To these happy people was born a son, Marvin B. Horton. disposition, a patient mother, a wonderful mother-in-law, and a good neighbor and friend. She felt that she had a very special daughter-in-law in Marvin's wife Ruby. In May, 1953,she had the misfortune to fall and fracture her hip and has been in ill health since. She was confined to her bed for the past three months. She was patient and so appreciative of all her care during her last days. She was a pleasure to care for. She slipped away quietly at noon, October 11, 1954, in a Pawnee City nursing home at the age of 78 years, 1 month and 13 days. ​Her husband Sid, as he was affectionately called, preceded her in death in 1950. Lottie leaves to mourn her passing her son Marvin, his wife and their three children of Denver, Colo.; two sisters Laura Widdifield of Denver, Colo. and Ella Skillet of Table Rock; and several nieces and nephews.